Spring has sprung and we couldn’t be more excited. The snow is melting, wildflowers are blooming and wildlife is emerging. While the snow in the mountains will take longer to melt, at lower elevations the snow has quickly disappeared. Which means our closer-to-town trails are cleared off and ready to hike. One of the easiest ways to explore Western Montana’s charming small towns is by foot. Stretch your legs and enjoy these leisurely hikes. 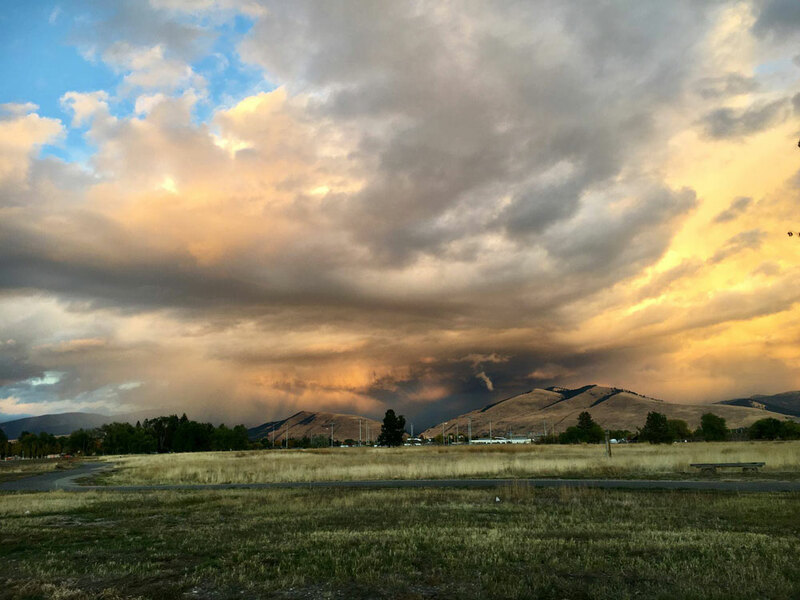 Directions: In Missoula—the cultural hub of Glacier Country—head to the newest city park: Fort Missoula Regional Park. Home to nine multisport fields, tennis courts, a dog park and more, Fortloop Trail loops the entire park—an approximately 2.5-mile hike. 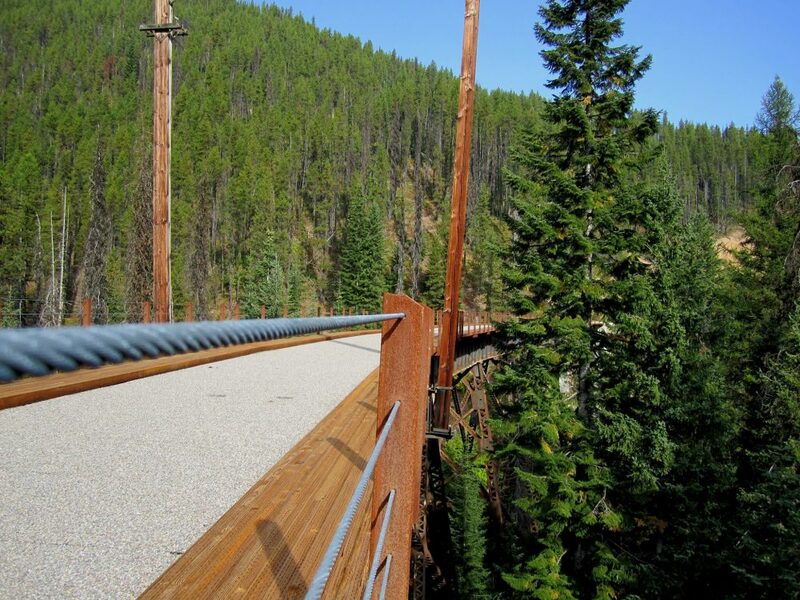 In total, there are 7 miles of trails to explore, some of which connect directly to the Historical Museum at Fort Missoula, which houses 20 historical structures and buildings on the grounds. Round Trip Distance: Fortloop Trail, 2.5 miles. Directions: Located in the heart of downtown Missoula, the Milwaukee Trail follows the Clark Fork River through downtown to the University of Montana. 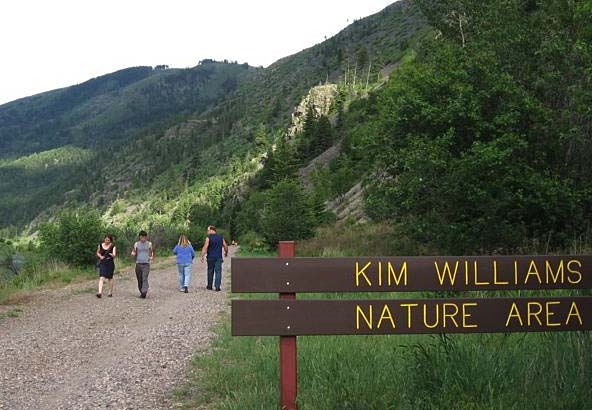 The trail then merges into the Kim Williams Nature Trail, and eventually between the Clark Fork River and the base of Mount Sentinel. On top of the old Milwaukee Railroad tracks, this trail is wide and flat. If you stay quiet along the river you’re likely to see wildlife, like blue herons and sandhill cranes or an osprey in one of the multiple nests along the way. To walk the entire length of the trail, park at McCormick Park. Round Trip Distance: From McCormick, 13 miles. For a shorter hike, turn around at the university, 4.4 miles. Directions: After exploring Libby, travel north on Highway 37, turn left at River Road and travel 4 miles. Turn right at Quartz Creek Road 600 and follow it for 5 miles, then turn left on West Fork Road. Continue until the road ends at a “T” junction. Turn left to follow Road 4690 7.3 miles to the trailhead. The Flagstaff Trail winds through grassy meadows, filled with wildflowers this time of year, and leads to the summit of Flagstaff Mountain. It’s 2 miles to the summit with an elevation gain of 1,642 ft. Once there, the trail continues another 3.45 miles, or you can turn around. Round Trip Distance: Flagstaff Mountain Summit, 4 miles. Directions: Whitefish has a network of in-town trails which are maintained year-round. The Whitefish River Trail, one of the most accessible walks, begins at Riverside Park. The paved path travels through town along the Whitefish River and along part of Whitefish Lake. The path eventually connects to Reservoir Road, just 0.5 miles from the Reservoir Trailhead of The Whitefish Trail—one of 12 trailheads that encompasses 42 miles of single track trails. Round Trip Distance: The Whitefish River path has approximately 15 miles of paved path, which then connects to The Whitefish Trail. Hike for however long you want, then turn around. 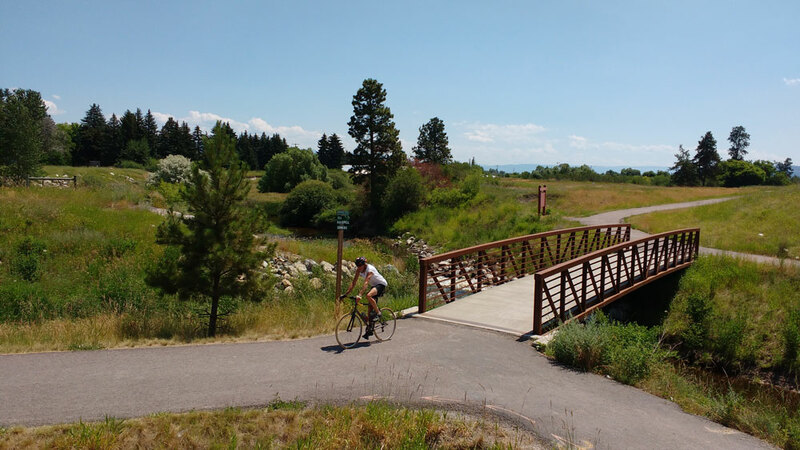 Directions: The Great Northern Historical Trail extends 22 miles between Somers—at the north end of Flathead Lake—and Kalispell, then South, ending at the tiny community of Kila (no amenities, but parking is available). Start in Somers, Kila or Kalispell. The trail follows the old Great Northern Railway route, serving up unrivaled views of the Swan, Mission, Salish and Whitefish ranges. To find the trail in Kalispell, head west until you meet the intersection of U.S. 2 and Spring Creek Road. Find parking just east of the intersection. Round Trip Distance: 44 miles round-trip. Pick your starting point, then turn around whenever you want. 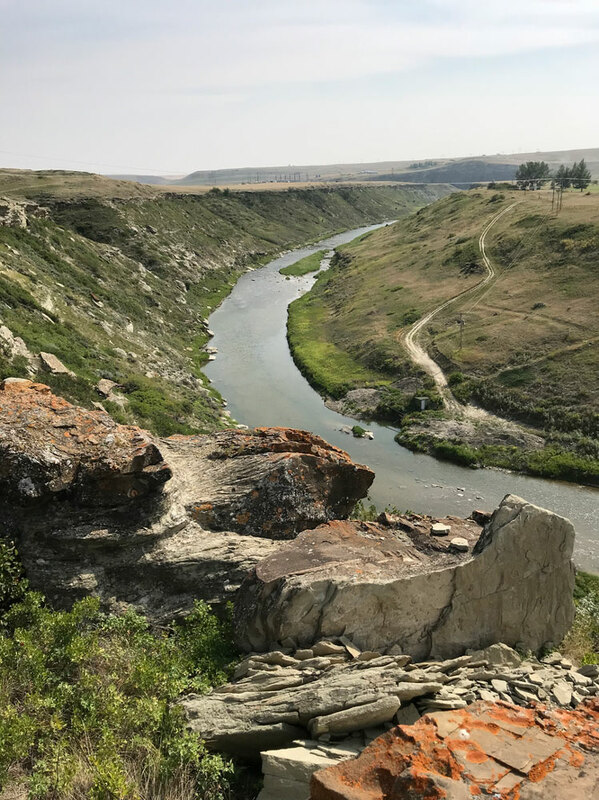 Enjoy views of the Cut Bank Coulee and rolling plains on the 2-mile Cut Bank Coulee Trail. Directions: From Cut Bank, find parking for the Cut Bank Coulee Trail at two trailheads. The east trailhead is located at Seventh Avenue South and Dean Drive. The west trailhead is located at Mountain View Boulevard and Lookout Road. This U-shaped trail follows the Cut Bank Creek Coulee for 2 miles. Round Trip Distance: 4 miles. Directions: Mule Pasture Loop is 0.5 miles north of Thompson Falls. Follow the USFS direction signs from either the east or west ramp north of Highway 200. The Mule Pasture Loop travels through a beautiful wooded setting, which feels remote yet is in town. Round Trip Distance: 2.3 miles. If trekking up steep hills and mountains isn’t your idea of fun, these hikes are a great option— allowing you to get outdoors but keep things casual. Enjoy these hikes year-round and find more trails at glaciermt.com/hiking. This entry was posted in Cut Bank, Kalispell, Kila, Libby, Missoula, Outdoor Fun, Parks, Somers, Things To Do, Thompson Falls, Whitefish on April 1, 2019 by GlacierMT. Western Montana’s pristine landscape makes for prime bird habitat. Our skies are graced with soaring raptors, our lakes and rivers are flush with waterfowl and shorebirds, and our grasslands and woodlands are visited by beautiful songbirds. Whether you’re an avid birder checking birds off a life list, or someone who just wants a look at something wild and free, there’s plenty of opportunity to catch some good glimpses of Glacier Country’s feathered residents. There’s no better way to locate and learn about Western Montana’s birds than to go on a birding trip with a local expert. Glacier Country is home to four chapters of the Audubon Society: Bitterroot Audubon, Five Valleys Audubon, Flathead Audubon, and Mission Mountain Audubon. These groups frequently offer free or low-cost outings, but you may need to sign up in advance. Usually the group leader sets up a spotting scope for everyone to share, but you’ll want to bring your own binoculars. 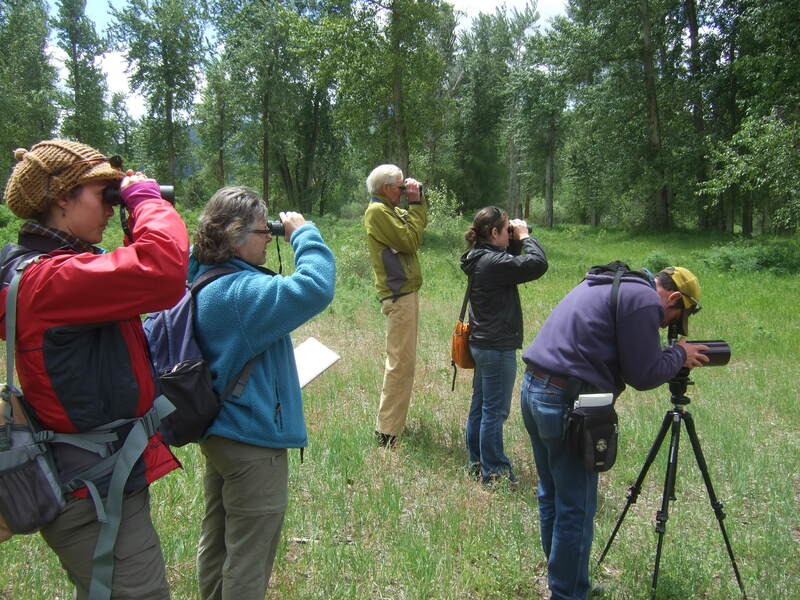 Check out The Montana Natural History Center in Missoula for birding events, like Naturalist Field Weekend: Sage Grouse Experience at the end of April and Naturalist Field Day: Birding by Ear in May. In the Bitterroot Valley there’s no better place to bird-watch than Stevensville’s Lee Metcalf Wildlife Refuge. More than 225 species of birds have been recorded there. Hit the riparian habitat along the walking path by the Bitterroot River trail. Don’t miss the ponds on the north end of the park that fill with migrating waterfowl in the spring and fall. Downtown Missoula is steps away from the Riverfront Trail, where even without binoculars you can often spot osprey, great blue herons, kingfishers, and more. If you’re willing to venture a little further, the Rattlesnake National Recreation Area is teeming with avian life. Word is, birders often don’t even need to leave the parking lot. The Flathead Valley’s Owen Sowerwine Natural Area abounds with songbirds and waterfowl. Also scope out the West Valley Ponds, where there’s a new viewing area from which to see hundreds of sandhill cranes during fall migration. Base your birding adventure out of the Mission Valley. There are three outstanding destinations here: the National Bison Range, Ninepipe National Wildlife Refuge and Pablo National Wildlife Refuge. 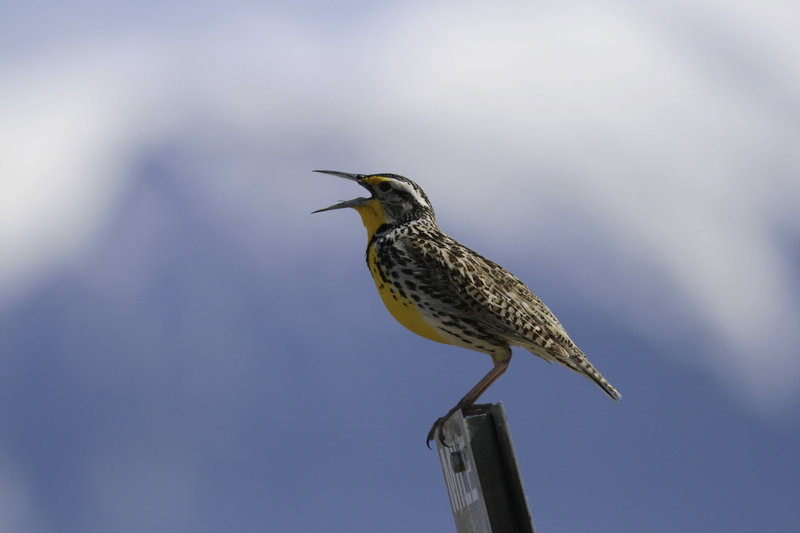 Montana’s state bird, the western meadowlark, can be seen in abundance at the National Bison Range in the spring and summer. This medium-sized songbird with a striking yellow neck and chest nests and forages in tall grasses, so you’ll often hear its beautiful voice before seeing it. Luckily, you won’t have to wait long before it flies up to perch on a fence or a shrub to put on a concert for you. 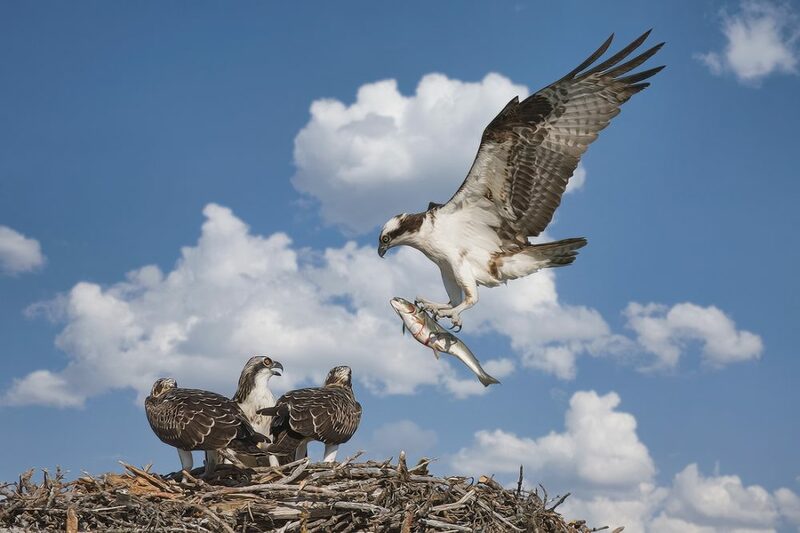 The osprey is one of Glacier Country’s most recognizable birds. Not only is the city of Missoula’s semi-pro baseball team named after this charismatic raptor, but the stadium includes a nesting platform where an osprey pair can be reliably seen from April through September. It’s a real treat to watch one fishing—osprey plunge feet first into the water to grab a fish, which they’ll hold facing forward and upright in their talons as they glide off to find a dining spot. 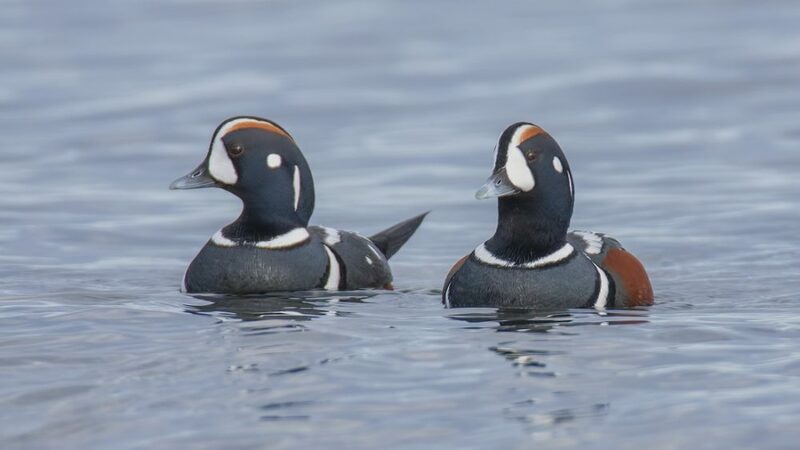 Glacier National Park claims the densest population of harlequin ducks in the state and is, therefore, one of the best places to find them. Still, one researcher claims it’s rarer to spot a harlequin than a grizzly. Harlequins are the only North American duck that breed and forage in clear, fast rivers and streams. Keep an eye out for these distinctively colored ducks during May and June at Upper McDonald Creek near the Going-to-the-Sun Road. A variety of woodpeckers call Western Montana home for part of the year. 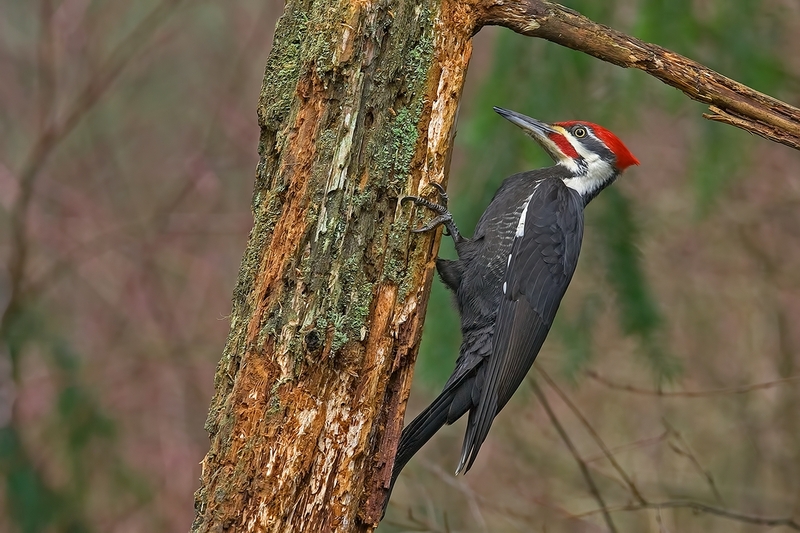 Named after Corps of Discovery adventurer Meriwether Lewis, Lewis’s woodpeckers can be spotted in Council Grove State Park from roughly May through August. Look for dead trees, where the birds nest in cavities. Their greenish-black back and wings, salmon-colored bellies and red faces make them easy to identify. Over a foot long, with black bodies, white-striped faces and flaming red crests, pileated woodpeckers are always an exciting find. Their loud calls and drumming will help you locate these year-round residents in their forest habitat, like the cottonwood snags in the Owen Sowerwine Natural Area. Mountain bluebirds match the color of Western Montana skies. 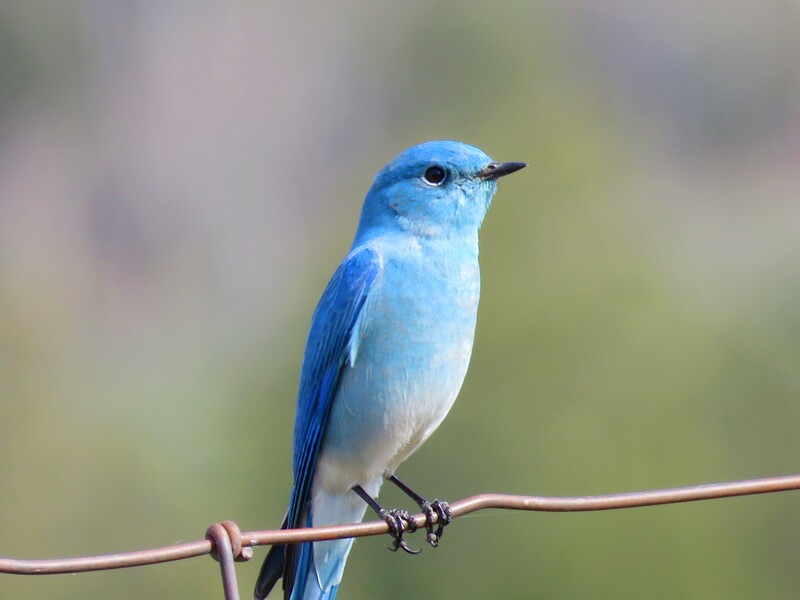 Glacier Country’s skies get even bluer when mountain bluebirds and western bluebirds arrive in the spring. The males of these two species of songbirds are easy to tell apart; mountain bluebirds are blue all over, while western bluebirds sport an orange chest. Western bluebirds prefer open woodlands like Blue Mountain in Missoula. Mountain bluebirds are prevalent at the National Bison Range. Like western meadowlarks, both species flit between the ground and low perches. 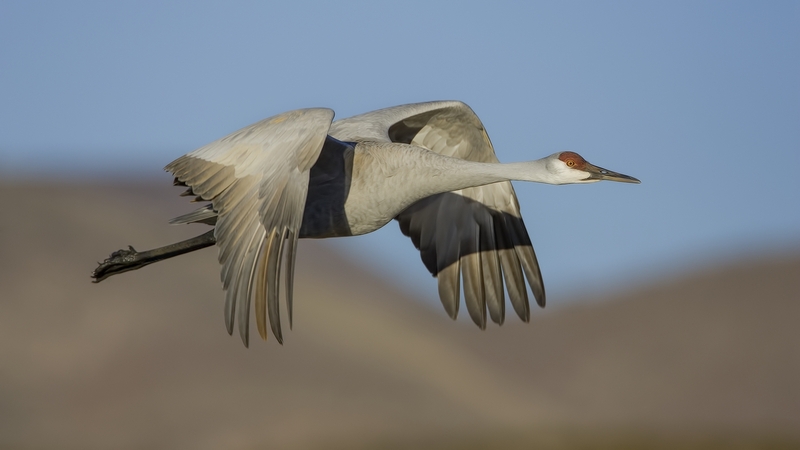 One of the largest birds you’ll see in Montana is the sandhill crane at 3.5 feet tall with a 6-foot wingspan. These elegant gray giants fly with neck and legs extended, looking like prehistoric pterodactyls come to life. From April to October, the long-legged cranes can be seen in open habitats like marshes and grasslands. The best place to spot them is during fall migration at the new viewing platform in West Valley near Kalispell. 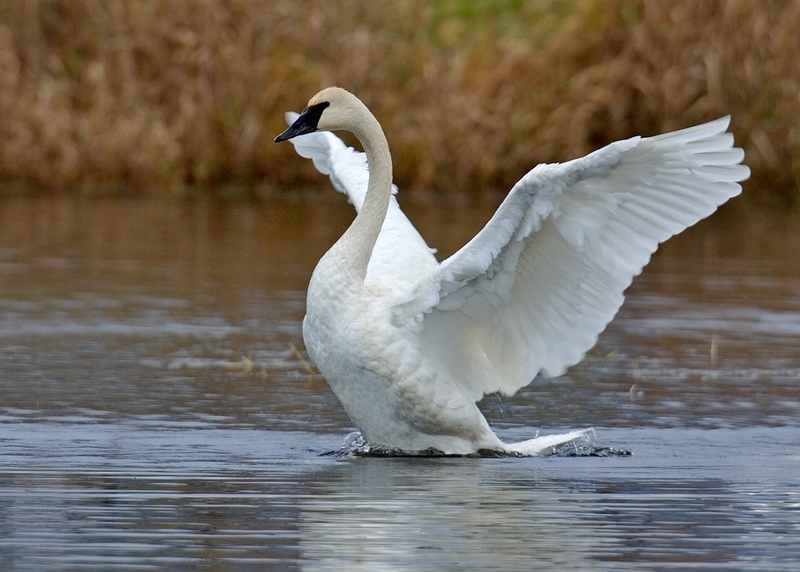 For a chance to see America’s largest waterfowl, the trumpeter swan, head to the Flathead Indian Reservation’s Pablo National Wildlife Refuge, where these impressive birds have been successfully reintroduced. Biologists for the Confederated Salish and Kootenai Tribes have been working for 20 years to establish a viable population, which now numbers roughly 200 swans. 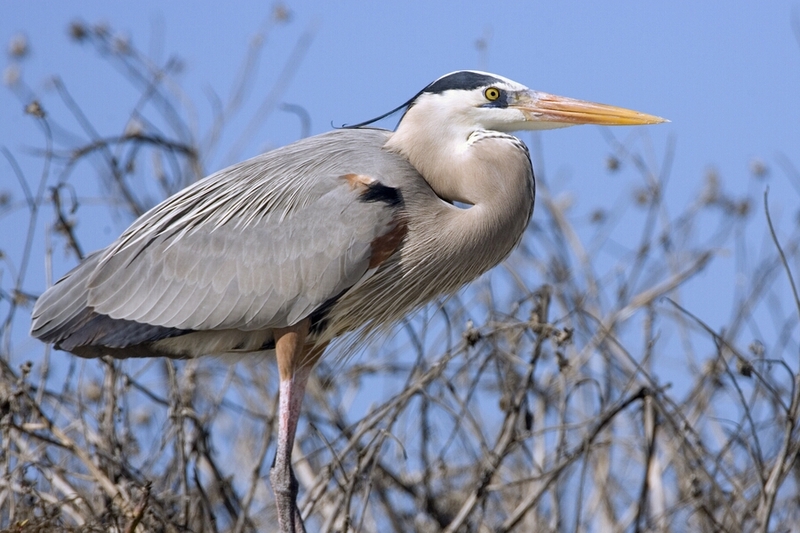 The majestic great blue heron can be found year-round almost anywhere there’s a river, lake or wetland. Birders can get relatively close to the nesting colonies at Lee Metcalf Wildlife Refuge. In the spring and summer, the conifers near the pond host several nests each, and visitors are treated to an abundance of heron activity. 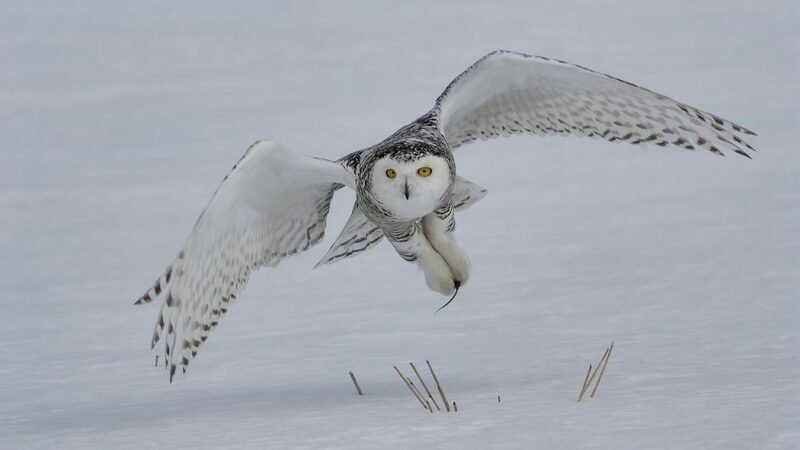 Western Montana is home to 15 owl species, and one of the foremost owl researchers in the world, Denver Holt. His Owl Research Institute, based out of Charlo, often leads workshops and field days, which are open to the public. Driving through the Flathead and Mission Valleys in the winter, you’ll want to keep your eyes peeled for snowy owls—they sometimes migrate down from the Arctic to feast on voles. 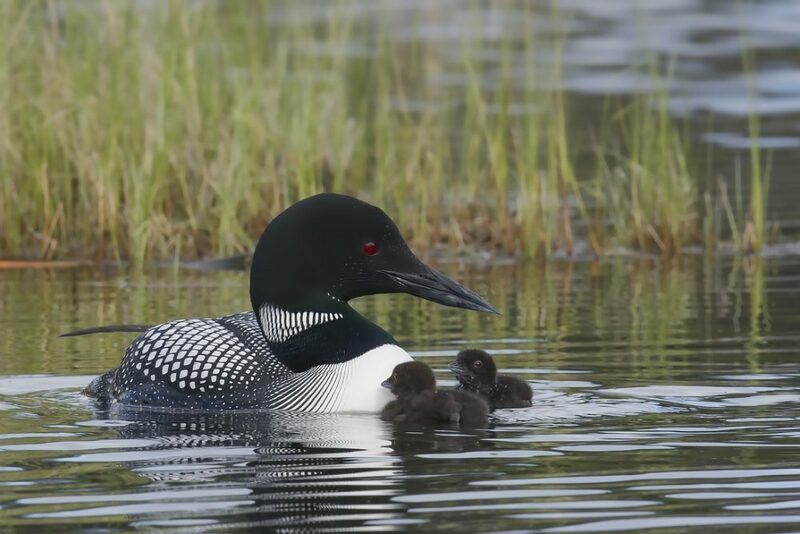 Glacier Country boasts the only common loon habitat in Montana. If you’re hoping to hear this black and white bird’s legendary call, visit Spencer Lake west of Whitefish from March through September. There are three distinctive vocalizations you might hear during the summer months: 1) a long, and some say eerie, cry, 2) a high-pitched fast call, and 3) the territorial yodel of the males. For more information on birding in Western Montana, visit glaciermt.com/birding. This entry was posted in Bitterroot Valley, Charlo, Flathead Valley, Glacier National Park, Kalispell, Missoula, Moiese, Montana, Montana Fun, Outdoor Fun, Pablo, Parks, Stevensville, Summer, Things To Do, Whitefish, Wildlife on March 25, 2019 by glaciermt. Spring is one of the best—and most underrated—times to visit Western Montana. Shoulder season prices are in effect, wildflowers are blooming and wildlife is emerging; the splendor of spring is not to be missed. As the temperatures warm, our vibrant small towns are ready to celebrate spring and the special events and festivals it brings. Whether you’re interested in sporting competitions or food festivals, we have something for everyone. Plan these events into your schedule. You’ll be glad you did. 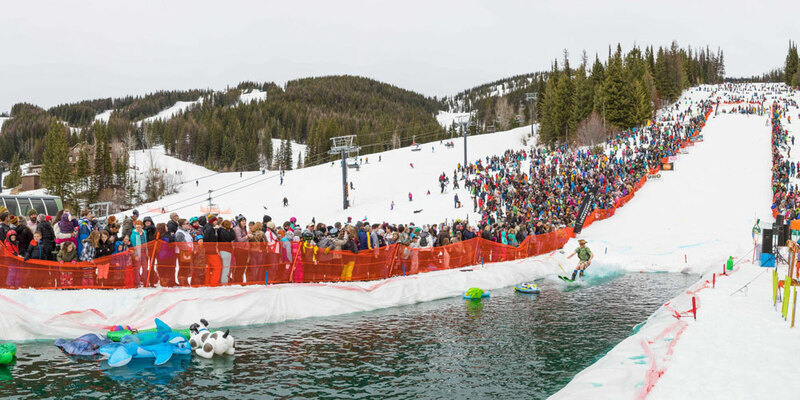 Whitefish Mountain Resort ends each ski season with a splash at the Whitefish Pond Skim. In early April, watch skiers and snowboarders attempt to skim across a man-made pond, avoiding zebra floaties and other obstacles. It’s outrageously entertaining. Did we mention costumes are required? Glacier Country is home to two Indian reservations—the Flathead and the Blackfeet. The tribal nations here often share their culture and traditions through pow wows and storytelling. This spring marks the 51st Annual Kyiyo Pow Wow Celebration in Missoula, mid-April at the University of Montana. 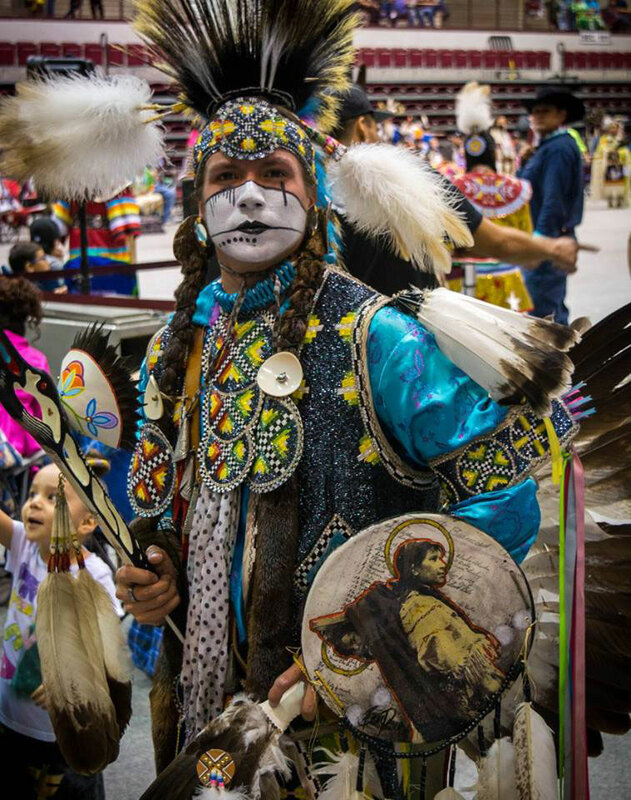 Filled with dance competitions, singing and traditional drumming, this gathering is an unforgettable experience for people of all ages. 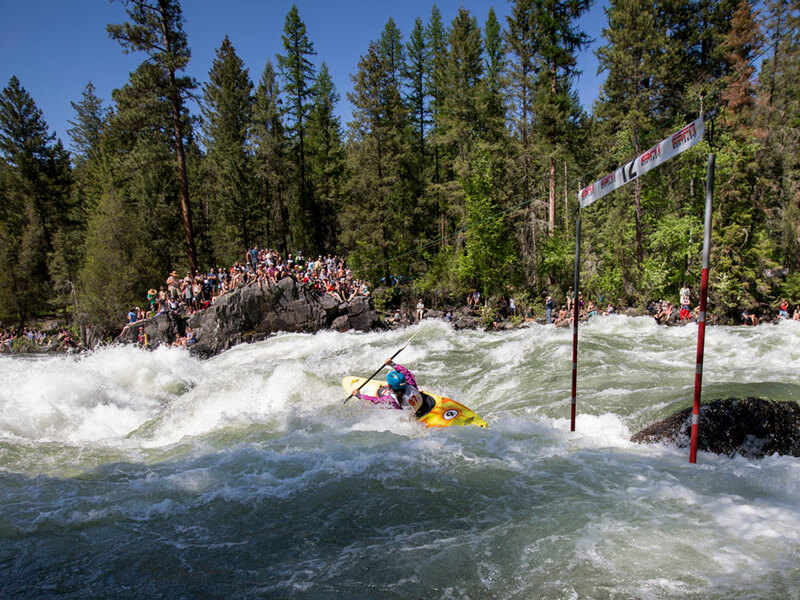 The Bigfork Whitewater Festival—annually at the end of May—is a much-anticipated event not just for whitewater enthusiasts. This extreme whitewater kayaking competition draws competitors from around the world and spectators have multiple unique vantage points to view kayakers maneuvering through whitewater. Accompanied by a community celebration, this is a fun—and usually pretty lively—event. You’d be hard pressed to find a more authentic timber sports competition than Forestry Day at the Historical Museum at Fort Missoula. 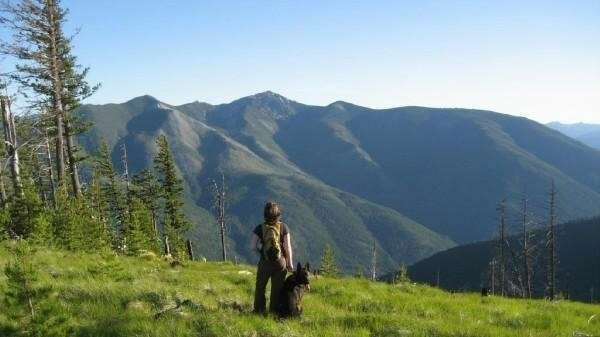 This competition pays tribute to the bravery of loggers and honors Montana’s history. 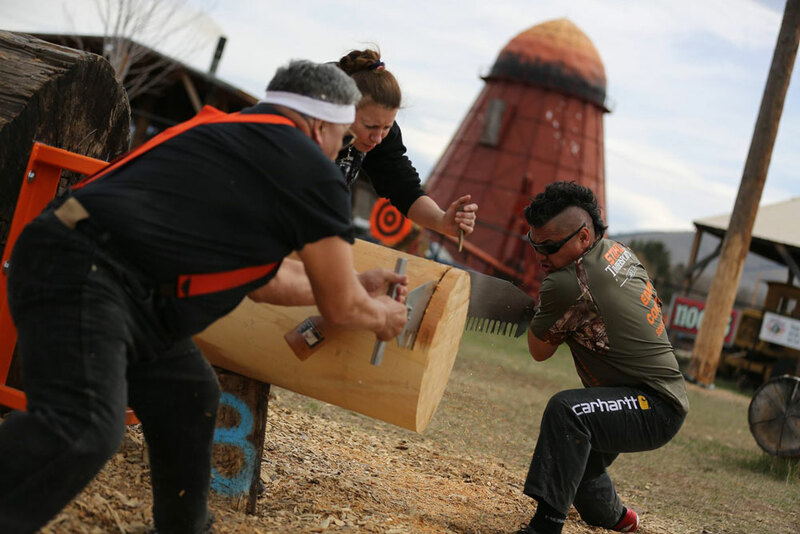 Excitement is palpable during the log rolling, pole climbing and ax throwing competitions. This event includes antique logging equipment exhibits and demonstrations. Glacier Country is home to many world-class chefs and culinary artists; their dishes are inspired by the sheer beauty of our landscapes and pay homage to Montana’s wild places. 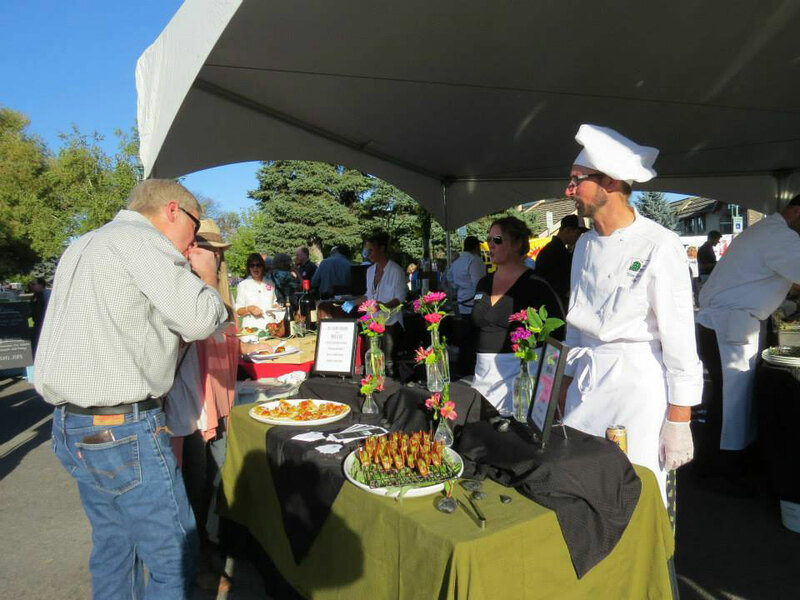 Feast on flavor at one of the many food festivals that dot the region with deliciousness. Food celebrations let you sample a range of cuisines—from fine dining to comfort food and everything in between. Glacier Country is becoming known for craft beer. We’re home to more than 30 breweries, after all, so it shouldn’t come as a surprise that one of the things we do best is put on an epic brewfest. 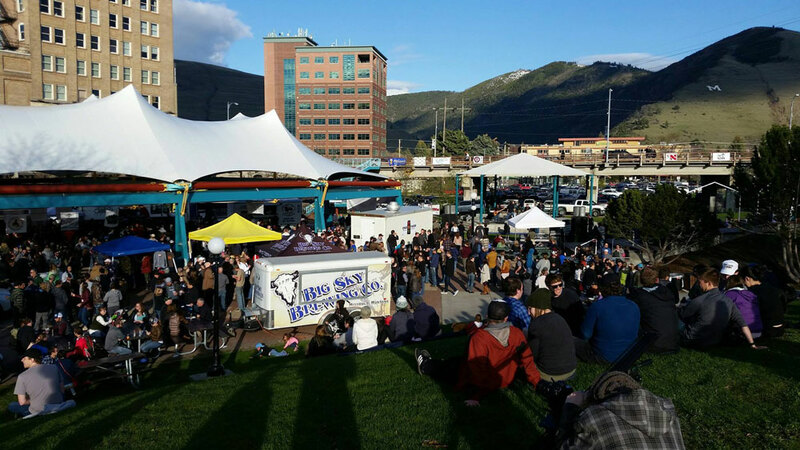 One of our larger events, Garden City Brewfest in Missoula in early May, boasts more than 70 local craft beers, wines and ciders. Savor the sip, then satisfy any food cravings at on-site food trucks. At the end of April, Missoula’s Bacon and Brewfest pairs two of our favorite things—beer and bacon! 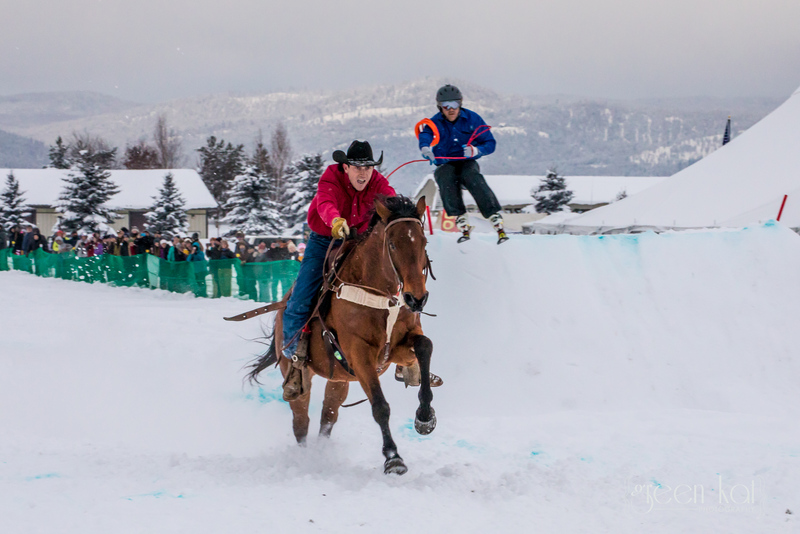 Whitefish hosts the Dummy Derby & Winter Brewfest in late March. In early June, the Fork to Farm Bike Tour is a cycling adventure to culinary bliss. 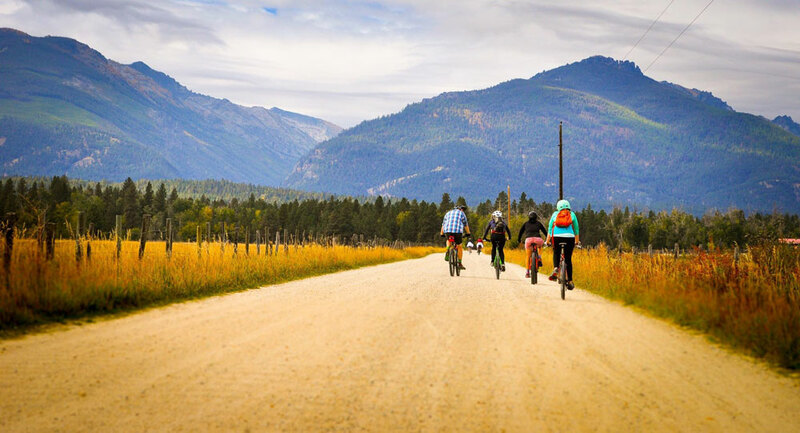 This 40-mile bike ride through the beautiful Bitterroot Valley stops at four farms for agricultural tours. Fuel up at each stop on delicious, locally sourced tapas cuisine. At the end of the ride you’ll be greeted with live music, a full dinner, cider and beer. 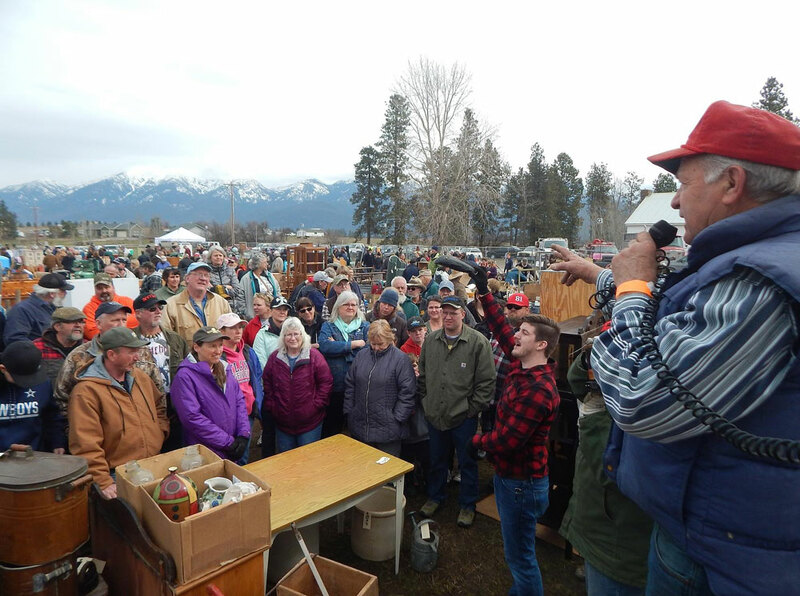 For a small-town auction experience—one known for bringing in several thousand people—attend the 53rd Annual Creston Auction & Country Fair in early April. Auction items range from Montana made art, goods and wares, to farm and ranch equipment. Montana treasures come in all makes and styles, new and old. For other celebrated events in Glacier Country, visit our events page. This entry was posted in American Indian, Arts and Culture, Bigfork, Bitterroot Valley, Contests, Events, Family Fun, Food, Kalispell, Missoula, Montana, Montana Fun, Native American Culture, Spring, Things To Do, Whitefish on March 18, 2019 by GlacierMT. The gorgeous Montana landscape inspires runners to get out in the fresh mountain air, and springtime is a major motivator for lacing up and hitting the roads and trails. Many of our charming small towns play host to races that not only bring the community together, but also provide an authentic Montana experience to out-of-town runners. The town of Arlee on the Flathead Indian Reservation puts on one of the first of Western Montana’s springtime races—the Buttercup Run. 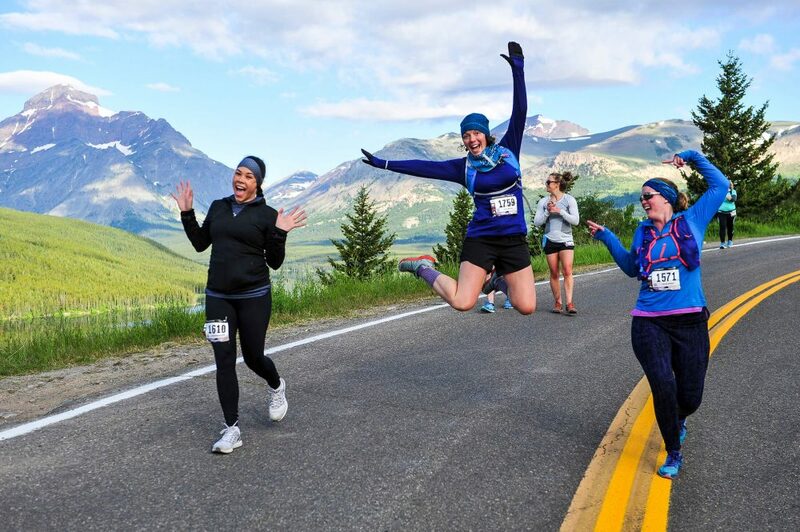 This is a chance to see the incredible small-town spirit of Glacier Country—the whole community comes out for the wide range of events: a 1 mile, 5K, 10K and half marathon. No matter which run you choose, views of the beautiful Jocko Valley and the Mission Mountains stretch the distance. Serious swag: A long-sleeved T-shirt with wildlife art by a local artist. 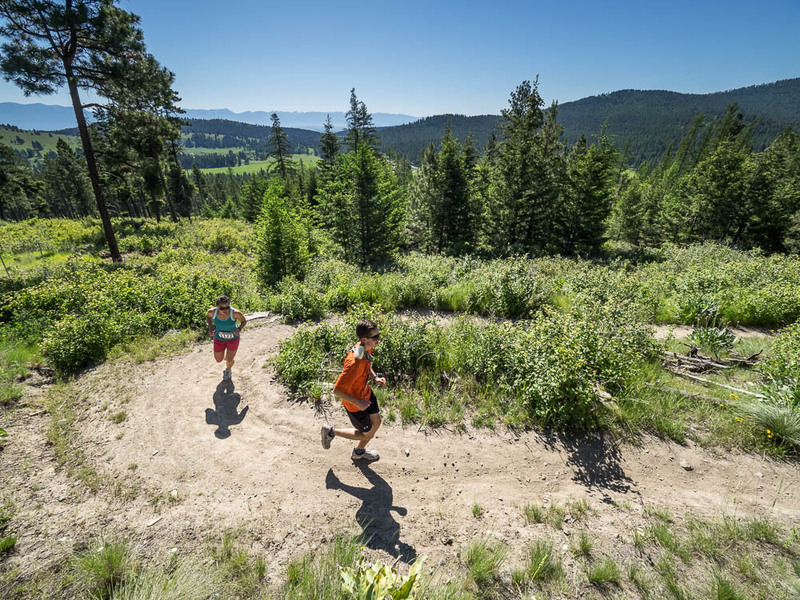 Kick off trail running season in Montana by entering the first race in the 2019 Runner’s Edge Trail Race Series. Both the 5.2 and 9.7 mile runs follow challenging single track trails on Lolo’s forested hillsides in the beautiful Bitterroot Valley. Finishers can replenish their energy with a generous post-race brunch—and beer from Big Sky Brewing Co. Serious swag: A Bitterroot Runoff logo buff and a custom finisher award. Run Wild Missoula, the running club that heads up the famed Missoula Marathon, heads south to Victor to put on the Sweathouse Half Marathon. This race has been a late September staple, but moved to May this year; be one of the first to run this course in the springtime! Named for nearby Sweathouse Falls, this race presents a wonderful opportunity to take in 13.1 miles of scenic backroads in the gorgeous Bitterroot Valley. Serious swag: A short-sleeved technical T-shirt and a finisher medal. 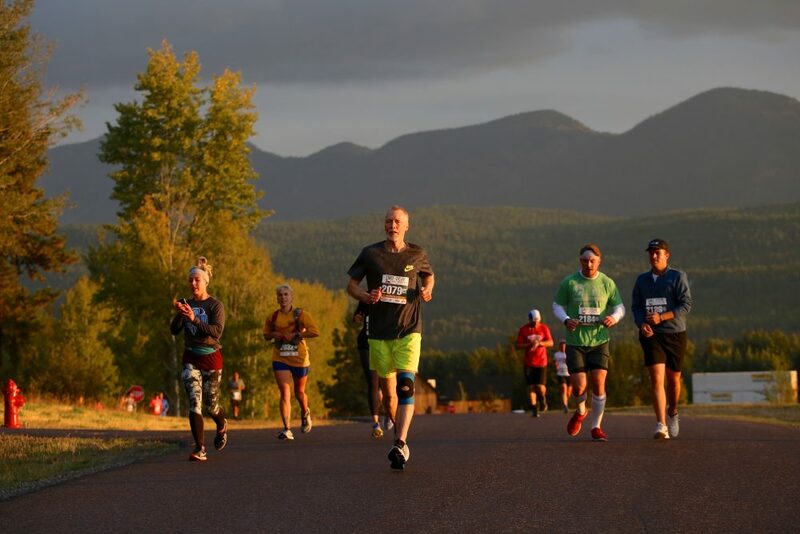 The 2019 edition of the Whitefish Marathon features an all-new blacktop course that skirts the edges of Glacier National Park. Incredible landscapes unfold as you race toward the finish line of the marathon, half marathon or 5K. Piggyback Barbecue serves runners a well-deserved post-race lunch. Serious swag: A finisher shirt, finisher medal and a day pass for The Wave Aqua + Fitness Center. All of the Trail Rail Run courses follow old Northern Pacific and Milwaukee Railroad grades through spectacular Lolo National Forest. These wide, forgiving dirt and gravel surfaces never rise above a two percent grade, so this could be your chance to get a PR! In the longest event of the Trail Rail Run, ultra-runners can race 50.5 miles from Mullan, Idaho to St. Regis, Montana. If that’s more than your quads and calves can handle, there are plenty of other distances to choose from: a 50-mile relay, 30K, 12K and 5K. All racers are bussed from St. Regis to their assorted starting points. Serious swag: Patagonia Houdini windbreaker jackets for 50-milers; T-shirts and a used railroad spike with an engraved plate for everyone else. Hot Springs Homesteader’s Days celebration includes the Skunk Alley Run, a 10K and a 3K along old logging roads above town. It’s perhaps the only race that starts with a whip crack, and one of the few where runners get to see cowboys and cowgirls working to keep a herd of cattle off the trail. Afterwards, take in an authentic small-town festival and soak your weary legs at Symes Hot Springs. Serious swag: T-shirt. 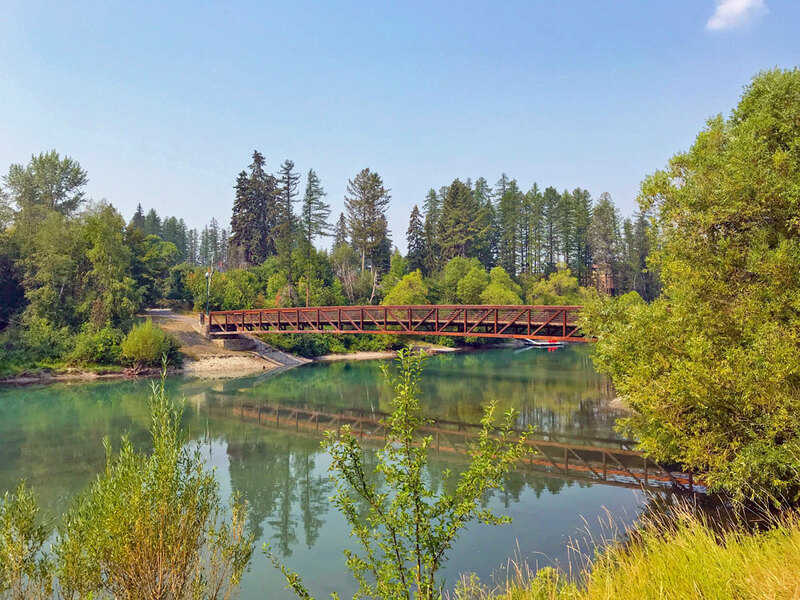 The expansive Foy’s to Blacktail Trail system in Kalispell’s Herron Park is the perfect setting for a half marathon, 10K, 5K and kids 1K. 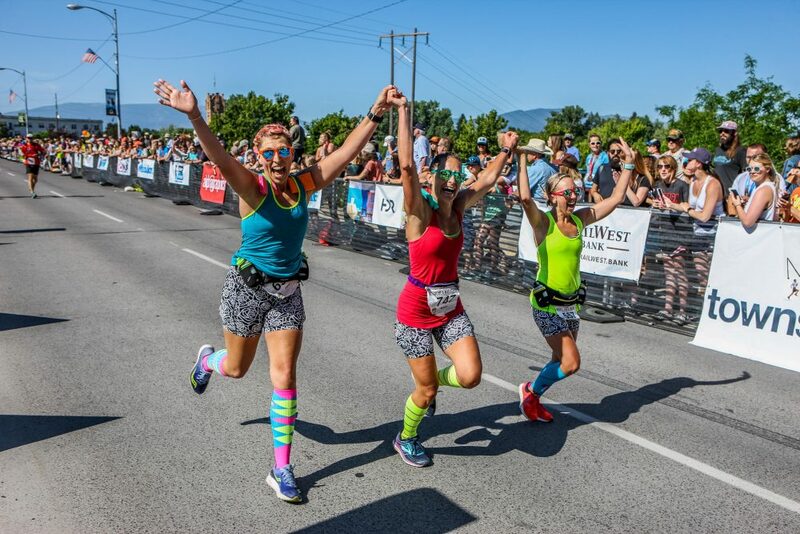 After some challenging climbs, the race’s 10K and half-marathon runners will be rewarded with awesome views of the Flathead Valley, while the 5K and 1K kids run provides a fun introduction to the fast-growing sport of trail running. Serious swag: The first 250 race participants receive a hat. Boasting one of Glacier Country’s highest altitude starting lines—5,223-foot Lolo Pass—Mountain to Meadow offers trail runners an irresistible challenge. Not only is the half marathon an extra half mile (13.6 miles), runners will also get in over 1,200 feet of climbing. Half marathoners and 5K racers have it much easier, with climbs of 300 and 100 feet respectively. What all three have in common is the flat stretch by historic Packer Meadow (Lewis and Clark camped here) where camas wildflowers should be in full bloom, coloring the whole meadow a stunning purple. Serious swag: Mountain to Meadow trucker hat. The payoff of this challenging run is the stunning Glacier National Park landscape, at sunrise no less. This course—on the Blackfeet Reservation in East Glacier Park—is unbelievably gorgeous. Climb Looking Glass Hill and take in views of Two Medicine Lake, ending at the iconic Glacier Park Lodge. Then, explore the park! Serious swag: Finisher medals and shirts for all participants. Test your mettle in a trail race amidst one of Glacier Country’s most beautiful places—Seeley Lake. The courses lead runners through the Rice Ridge burn area, which at this time of year is an eye-catching neon green and black. The Filling Station Bar and Grill hosts the after-party and primitive camping is free for runners. Serious swag: Finisher medals for 50 + 25K runners, and a shirt for all participants. Let’s see. 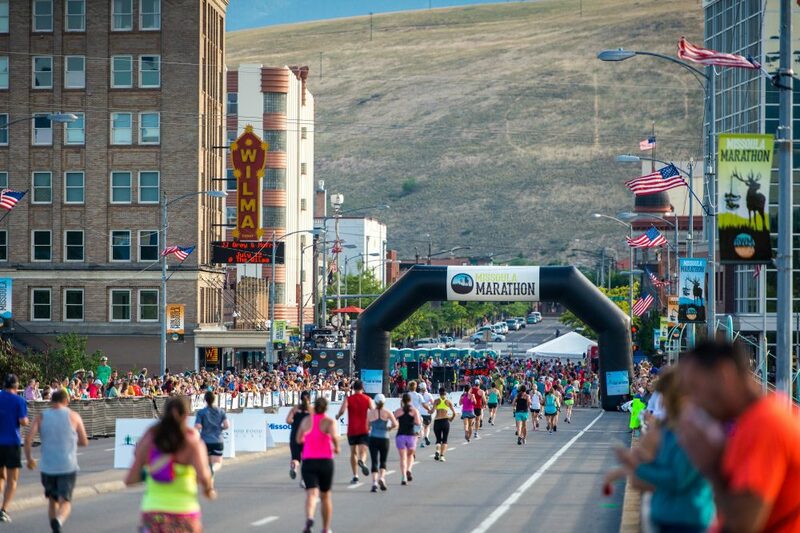 The Missoula Marathon was a named “Top 10 Bucket List Marathon” by Runner’s World in 2018, “#1 Marathon in the U.S.” by BibRave in 2017, the “Top Marathon for Back-of-the-Packers” by Runner’s World in 2017 and “Best Marathon in the U.S.” by Runner’s World in 2010. Need any more incentives to sign up? 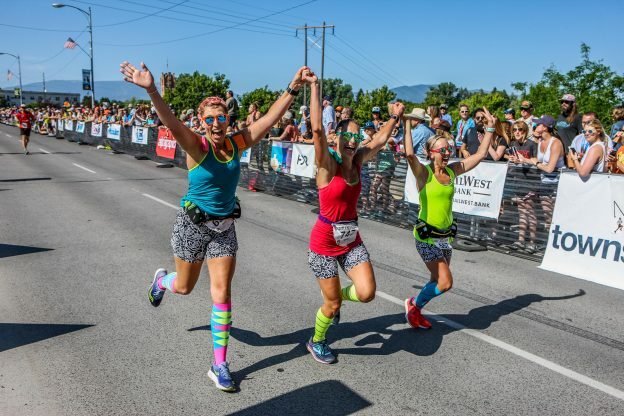 You’ve got it: There’s also a half marathon, a 5K, a kids marathon, an expo, a free beer run and a finish line flanked by cheering spectators in beautiful downtown Missoula on the banks of the Clark Fork River. Serious swag: Short-sleeved technical T-shirt, medal, on-course, finish line and post-race victory stand photos for all racers; half marathon and marathon finishers also receive a post-race beer from Big Sky Brewing and a post-race meal from the Good Food Store. This entry was posted in Arlee, Bitterroot Valley, East Glacier Park, Events, Glacier National Park, Hot Springs, Kalispell, Lolo, Missoula, Montana, Montana Fun, Outdoor Fun, Seeley Lake, St. Regis, Things To Do, Victor, Whitefish on March 11, 2019 by glaciermt. During the everchanging seasons in Western Montana outdoor adventures abound. Weekends are filled with epic lake days, Nordic excursions, biking and more. After all this recreating, you may need a rest. We get it—some days are meant for cozy clothes and relaxing with friends and family. Here are the top 10 brunch spots we’re digging in Glacier Country, for days when the only reason to get off the couch is to find food. Make Missoula a priority when planning your trip to Glacier Country—the food scene is one you won’t want to miss. 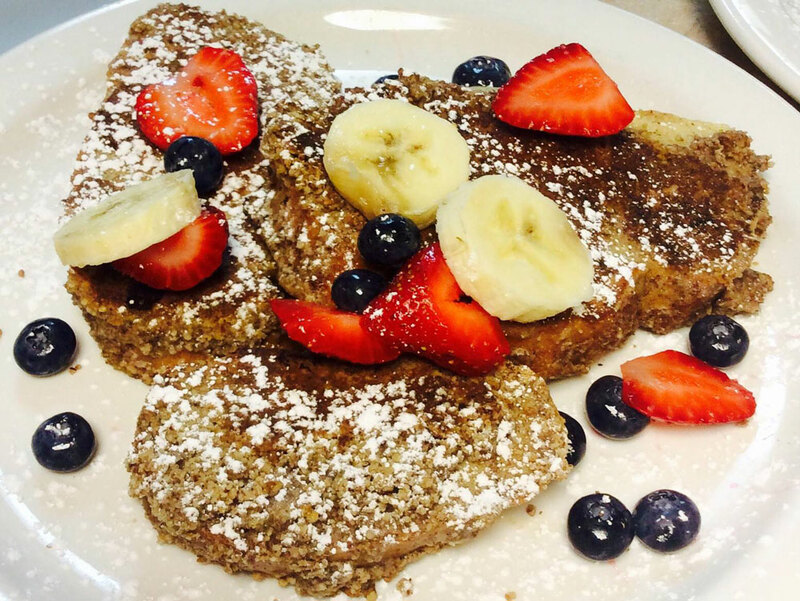 One of our favorite undiscovered brunch spots is The Trough. In the more rural part of town, this spot used to be a working dairy, hence the name of the adjacent market—The Olde Dairy. This newer restaurant has taken Missoula by storm, the food is worth bragging about and the experience is authentically Montana. Get a breakfast sandwich your way or try the Farmer’s Skillet. Creative recipes with mouthwatering dishes resulted in a following of “Bistronauts” for Burns St. Bistro. Not surprisingly, in 2017 locals voted it Best Brunch in Missoula. Themed brunches take the spotlight Saturday and Sunday—like the Star Trek Brunch or the Cheese Brunch. Monday – Friday grab breakfast, lunch or dinner; the everchanging menu makes this eatery one we never tire of. It’s hard to know what will be on the menu when you go, but we do know it will be delicious. When in Missoula, another local’s favorite is Tamarack Brewing Company. 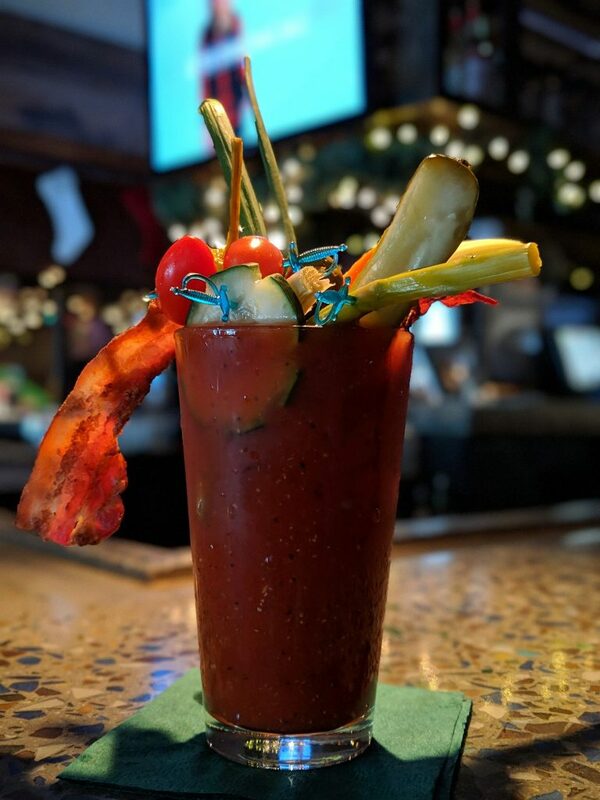 The build-your-own Bloody Mary bar has everything you could dream of putting in your drink—bacon, asparagus, pickles and more. 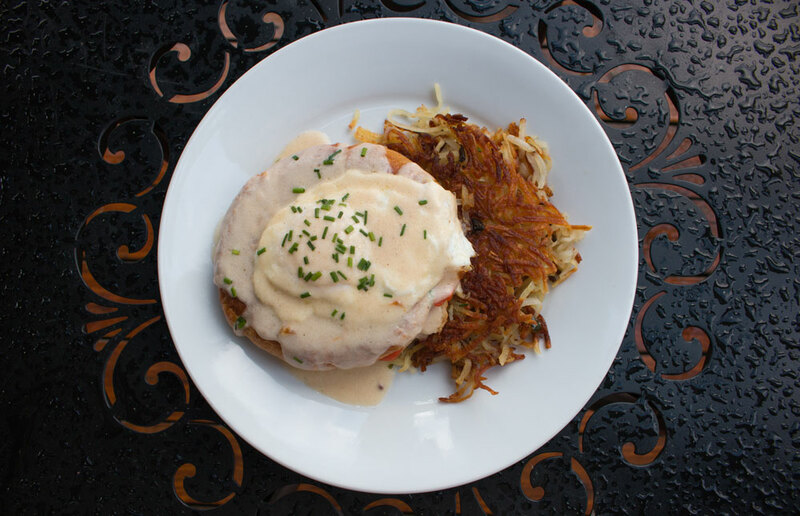 Once you have this staple of a good brunch secured, we recommend trying the chicken and waffles or biscuits and gravy. Open for brunch on weekends. 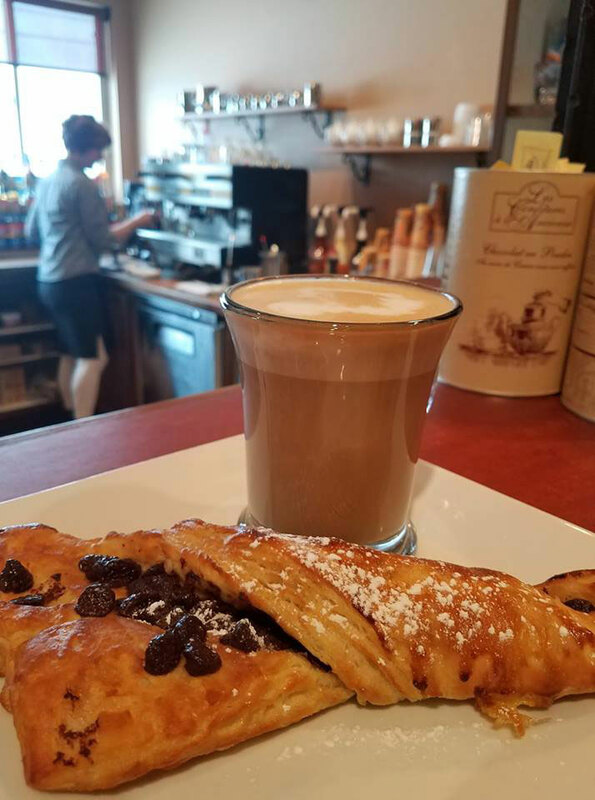 In the Missoula slant streets area hides a popular neighborhood hot spot, Caffè Dolce. With Italian fresco paintings donning the ceiling, this vibrant restaurant has carefully crafted a brunch menu that will delight your palate. 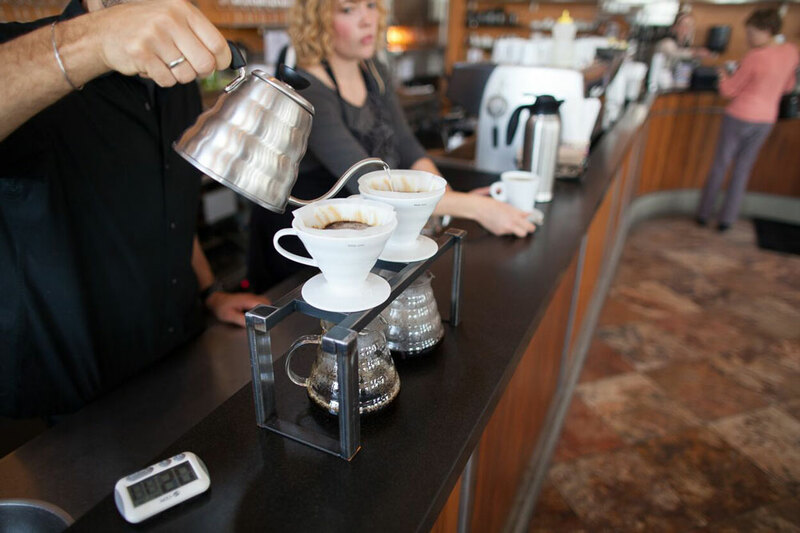 To bring your brunch game to the next level, try their meticulously created pour-over coffee paired with their seasonally changing scramble of the day. Brunch is on Sundays; breakfast, lunch and dinner are available Monday – Saturday. Mission Bistro in historic Stevensville sits on Main Street immersed in Old West charm. This quaint bistro serves up hearty meals with immense flavors, such as the wild mushroom and bacon scramble or the Monte Cristo sandwich. Open Sundays for brunch. Nestled at the base of the Bitterroot Mountains in Hamilton, you’ll find Taste of Paris. They’re known for fabulous crepes, served with an array of topping options like lemon juice with sugar or poached pears, chocolate sauce and Chantilly cream. Save room for dessert—pastries are made fresh daily. Open Sundays for brunch. If you’re venturing to the quintessential mountain town of Whitefish, be sure to stop at Swift Creek Cafe, which is open for breakfast and lunch seven days a week, and brunch on Sundays. 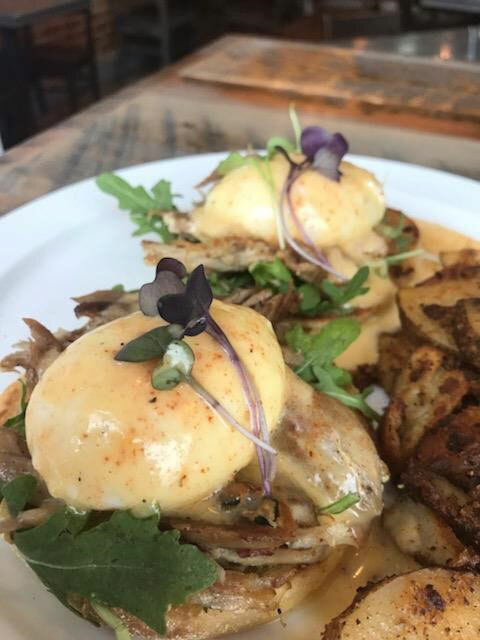 The owners, a father and son team, have a passion for food that is evident in their diverse dishes—the Braised Duck Benedict is a favorite of ours. The Boat Club at The Lodge at Whitefish Lake is the perfect place to savor exquisite Montana food. Try the Smoked Salmon Croque Madame, a croissant filled with salmon, spinach, avocado and cheese, topped with béchamel and a fried egg; it’s amazing. 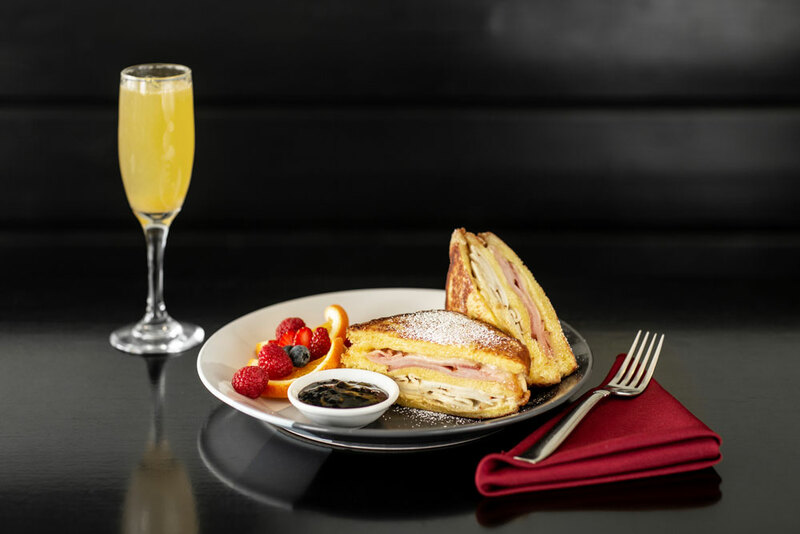 Pair brunch with a signature Apple Cider Mimosa for the complete dining experience. Brunch is served on Saturdays and Sundays. 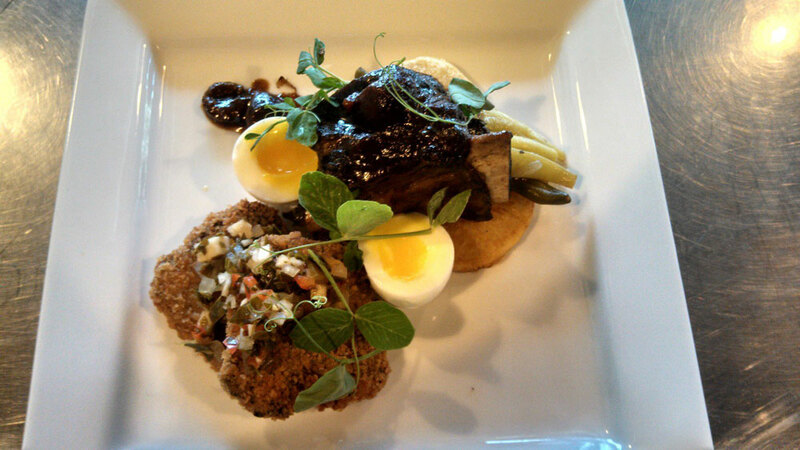 Get your farm-to-table fix at The Knead Cafe in Kalispell. On the menu you’ll find classics like eggs Benedict and vegetarian-friendly options such as a veggie frittata. For those looking for a sweeter option, try the pecan-crusted pancakes. Serving up warm western hospitality Monday – Saturday. This entry was posted in Bigfork, Bitterroot Valley, Food, Hamilton, Kalispell, Missoula, Montana, Stevensville, Whitefish on March 4, 2019 by GlacierMT. Glacier Country is flowing with distilleries—11 at the moment—and the grain-to-glass game here is strong. 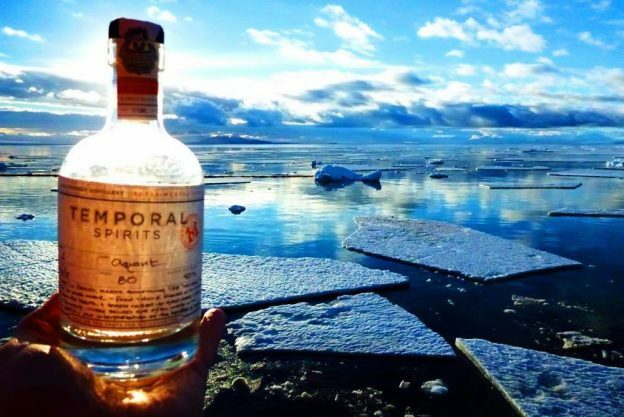 Our glacial waters and Rocky Mountain rivers beckon connoisseurs of fine spirits and exquisite flavors. 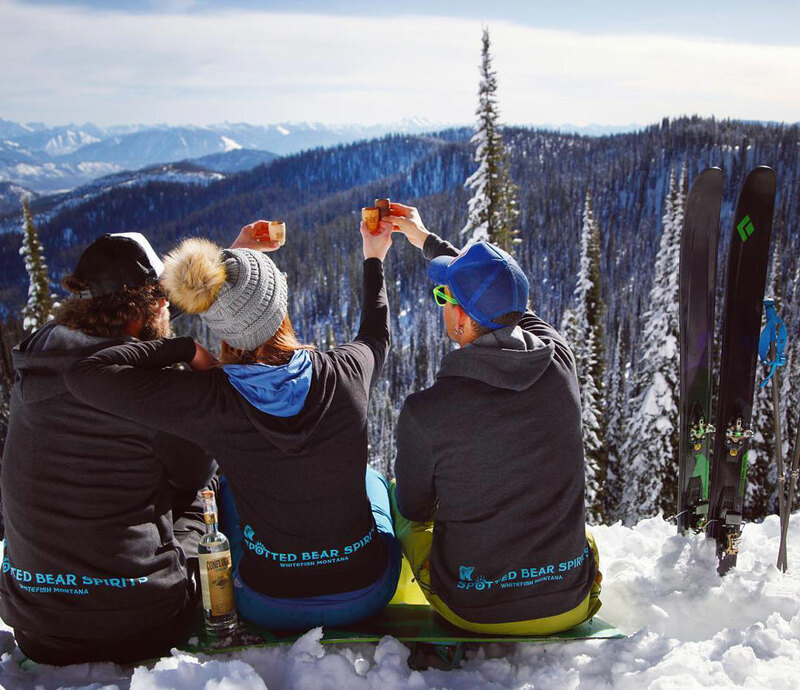 The next time you’re in Western Montana enjoying our winter wonderland or the splendor of spring, hit up one of our favorite spots to savor a sip. In the heart of downtown Missoula, Montgomery Distillery is the perfect place to wet your whistle. Inspired by traditional distilling methods, founders Ryan and Jenny traveled to Scotland to learn centuries-old techniques. Their cocktails dance the line between traditional and modern—the Bye Felicia is made with aquavit, a traditional Scandinavian spirit, mixed with pickled beets, lemon bitters, thyme and soda. The wheat and rye used in their distillery process come from their farm, which has been in the family for five generations. Montana Mixology – Go Gingerly: This perfect fusion of gin, ginger, basil and grapefruit is so good it was named among Redbook’s 51 of the Best Cocktail Recipes From Across America. More of a whiskey person? Don’t worry, we love whiskey and so does Glacier Distilling Company founder Nic Lee. A taste for whiskey is what inspired Lee to open a distillery in Coram, nestled in the northwest corner of Montana. A recent addition to the distillery, Josephine’s Bar & Kitchen is a restored homestead cabin next door. The kitchen, which is open seasonally, was named for bootlegger Josephine Doody who ran a bootleg operation in Glacier National Park. 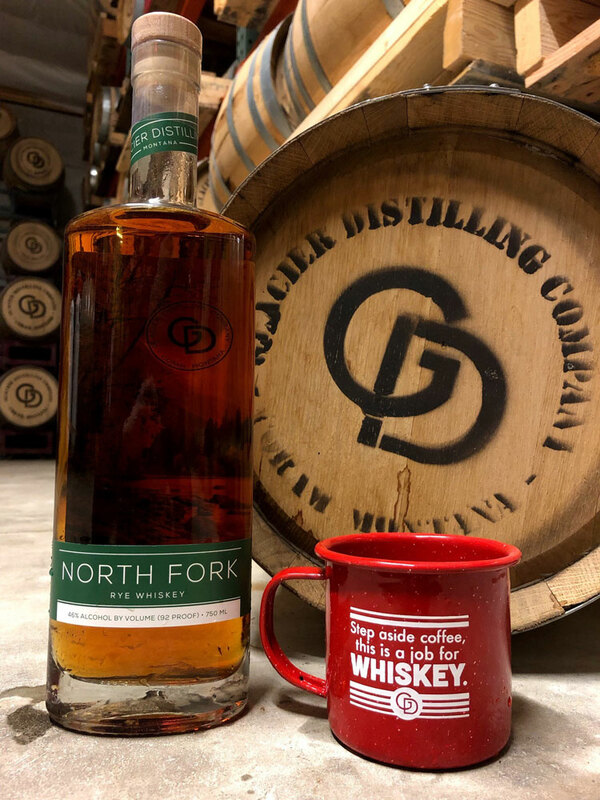 Montana Mixology – North Fork Hot Toddy: A favorite on cold or wet days, this mouthwatering concoction features North Fork Whiskey—a gold medal winner at the 2017 San Francisco World Spirits Competition—mixed with hot water, freshly squeezed lemon juice and honey simple syrup. If you’ve acquired a taste for absinthe, head to Vilya Spirits in Kalispell. An obsession with gardening combined with an appetite for spirits kicked off the start of the company in 2009. Many of the herbs in their spirits are grown in the owners’ garden, including Artemisia absinthium for absinthe. Montana Mixology – French-drip Absinthe: Experience traditionally crafted deliciousness that will delight your palate—Absinthe Verte, gold medal winner at the 2012 Denver World Spirits Competition, served over ice and topped with a sugar cube and club soda (or water). While in Kalispell, don’t forget to stop at Whitefish Handcrafted Spirits. 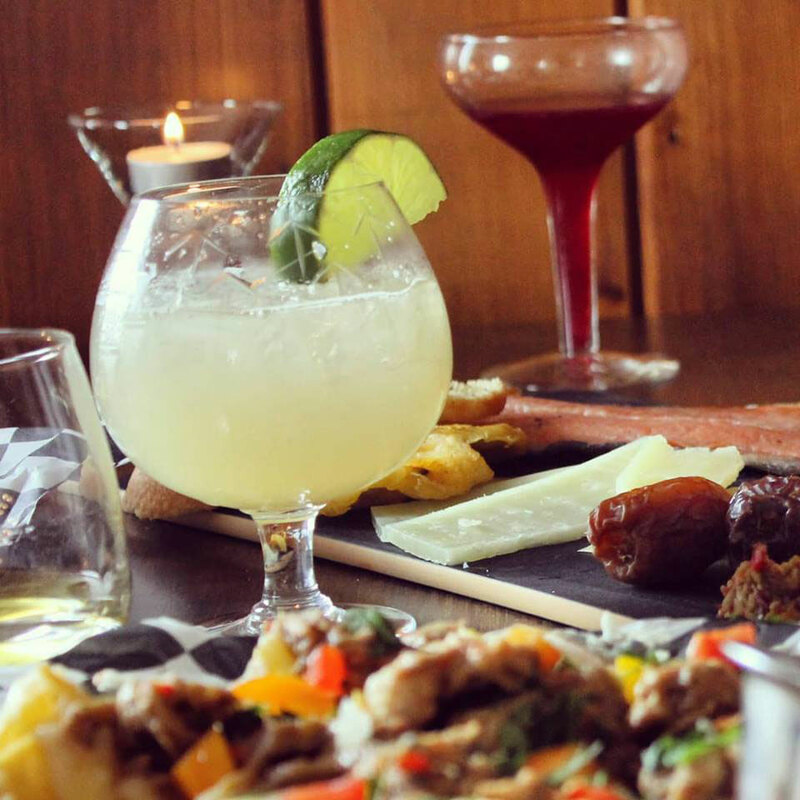 The tasting room is a one-stop shop for great cocktails and mouthwatering food. To complement their spirits, they sell premium cigars from their on-site humidor. Keep an eye out for their upcoming cabanas that will let you sip outside in cozy safari-style tents, regardless of the weather. Montana Mixology – Margarita: With weekly featured drinks it’s hard to choose a favorite, but if you’re searching for a classic, we recommend a salted lime margarita on the rocks. If it isn’t already, Spotted Bear Spirits needs to be on your list of places to stop in Whitefish. 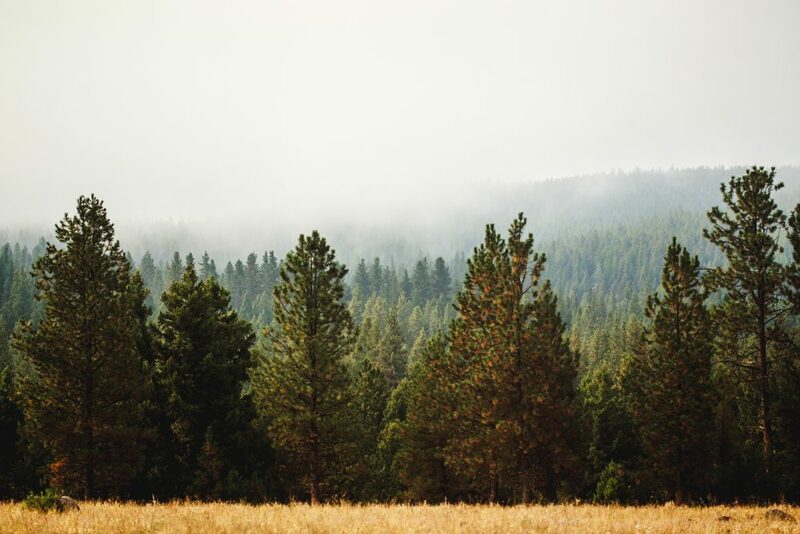 Spirits here are inspired by the unrivaled beauty of Western Montana’s landscapes. Their tasting room is the perfect spot for a post-adventure cocktail, with one of the friendliest atmospheres in the region. Montana Mixology – Snowghost: Made with Spotted Bear Vodka, Spotted Bear Coffee Liqueur, half-and-half, cold brew coffee and soda, this merger of sumptuous flavors is a must. A Moscow mule is the perfect ending to any day. Photo: Whistling Andy Inc.
Nestled in the quiet storybook village of Bigfork, Whistling Andy Inc. has been livening up the town since 2010. Try the Pink Peppercorn and Pear Gin, a labor of love that took two years to perfect, and won the 2017 Sip Northwest Best of the Northwest. Schedule a tour online with one of the distillers. 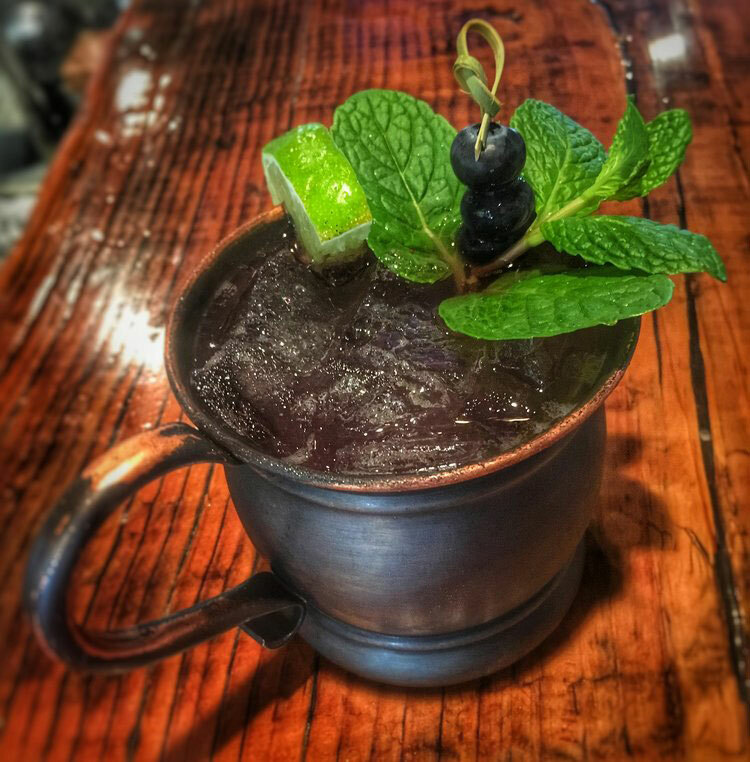 Montana Mixology – Blueberry Mule: If you love Moscow mules half as much as we do, you need to try Whistling Andy’s brilliant variation—Pink Peppercorn and Pear Gin mixed with blueberry syrup, ginger beer, basil and fresh lime. This entry was posted in Awards, Bigfork, Coram, Food, Kalispell, Missoula, Montana, Things To Do, Whitefish on February 25, 2019 by GlacierMT. Nature isn’t the only thing putting on a spectacular show in Western Montana’s Glacier Country. 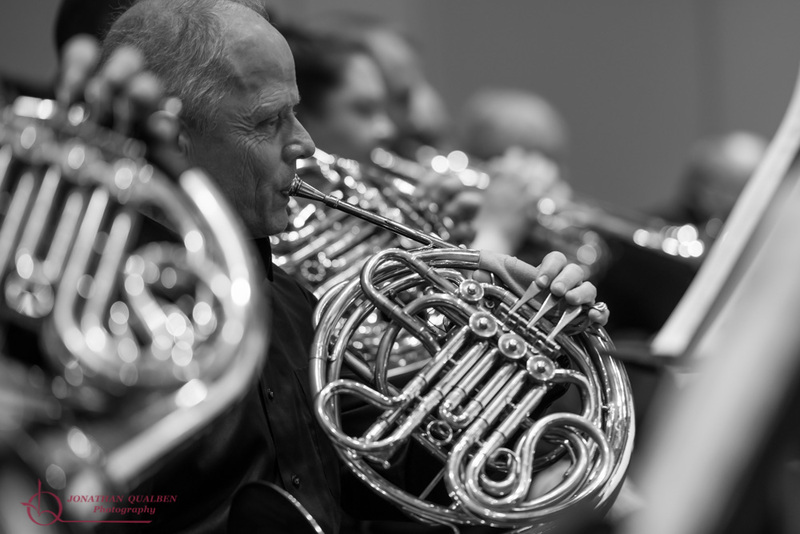 Talented performing artists flock to the region, inspired by the sheer beauty and wide-open landscape for artistic expression. Long-running theater companies and symphony orchestras have staged captivating performances here for decades. From community plays to Broadway-caliber theater to live concerts, Western Montana boasts a critically acclaimed performing arts scene. The Flathead Valley touts a pretty impressive commitment to the arts. 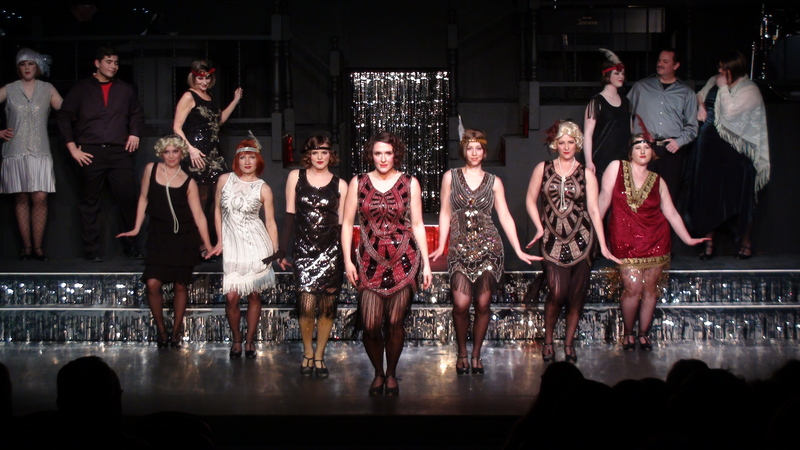 One of the region’s most renowned theater companies, the Bigfork Summer Playhouse, performs “Broadway in the Rockies” every summer. This storybook village on Flathead Lake has been wowing audiences for 60 years with many talented performers—like J.K. Simmons of Whiplash and Spider-Man fame—gracing the stage at the local playhouse. From a beautiful 1938 log theater on the south end of the lake, Port Polson Players has long been committed to community, children’s and summer theater with a captivating lineup of shows. In nearby Whitefish, the Alpine Theatre Project, founded by three Broadway veterans, brings Broadway to this charming mountain town, no doubt helping this community claim its spot as “One of the Top 10 Coolest Small Towns in America.” Kalispell’s Glacier Symphony Orchestra and Chorale offers live symphonic music concerts year-round including summer chamber series, outdoor pops and the Festival Amadeus. Another breathtakingly beautiful Western Montana valley—the Bitterroot—holds its own with the Hamilton Players, spotlighting the importance of education and community through theater, and the Stevensville Playhouse, offering a springtime lineup in a theater with quite the storied past, including being destroyed twice by fire. As the arts and culture hub of Glacier Country, Missoula packs a big punch in the performing arts realm. 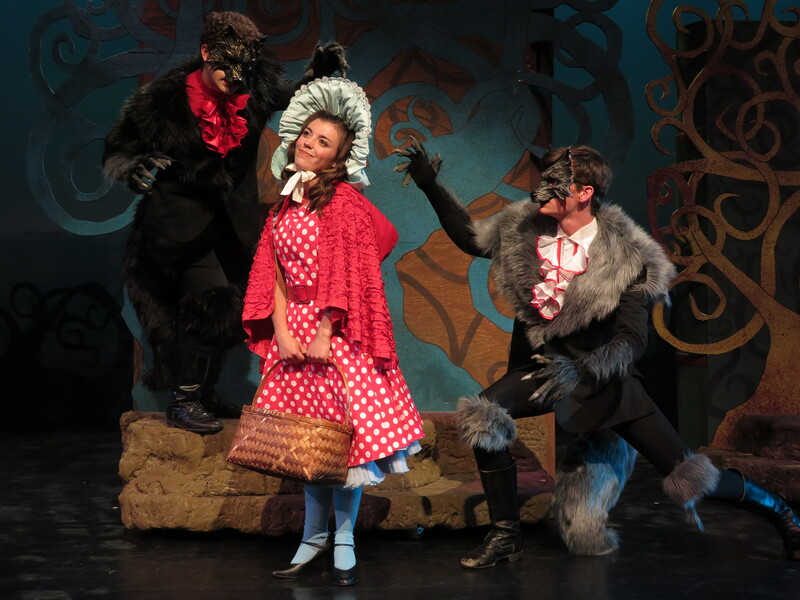 The year-round Missoula Community Theater presents five main-stage productions each season and the Missoula Children’s Theater—the nation’s largest touring children’s theater—tours 1,200 communities in all 50 states and Canada, plus schools and U.S. military bases in more than 15 countries. The artistically ambitious independent BetweenTheLines Theatre stages raw, contemporary performances at Missoula’s historic Roxy Theater. With a focus on celebrating the human spirit, the Montana Repertory Theatre at the University of Montana is one of the most respected touring companies in the country. You can catch an MRT performance at the Masquer Theatre on the UM campus during their short Missoula summer season, and they also host a Plays on Tap series where you can watch a “site-based theater for small audiences” performance one to two times a year at locations in Missoula, such as a local brewery or taproom. The UM’s School of Theatre & Dance also performs throughout the year. Enjoy an evening of dance at their popular annual Dance in Concert celebrating the captivating and finely crafted choreographic work of students, faculty and guest artists. 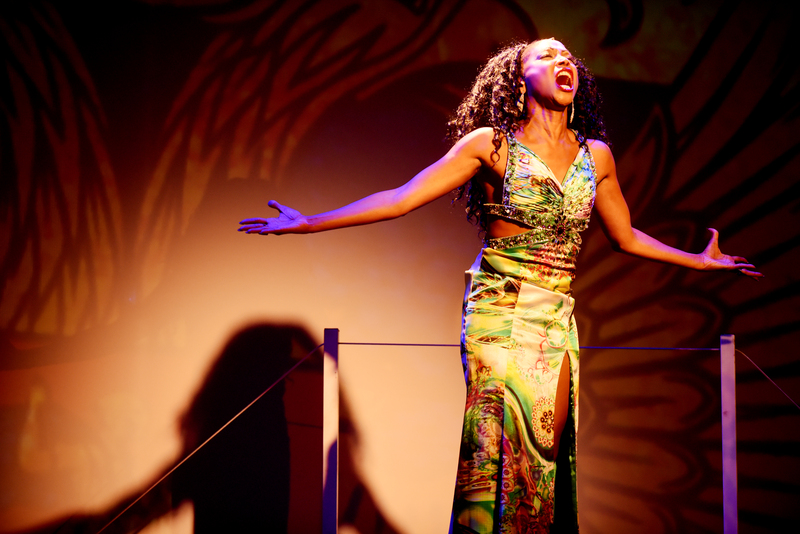 Check the UM box office for performing arts schedules and tickets. 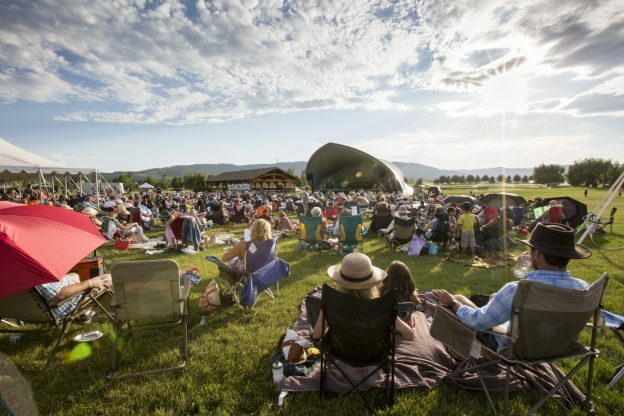 Experience the Missoula Symphony Orchestra at Caras Park in downtown Missoula each summer during their local’s favorite Symphony in the Park, or one of their six concerts throughout the year, including a show created specifically for kids. It’s a great way to experience the tight-knit community vibes Missoula is known for and the big talent coming out of small-town Montana. This entry was posted in Arts and Culture, Bigfork, Bitterroot Valley, Events, Flathead Valley, Hamilton, Kalispell, Missoula, Montana, Montana Fun, Polson, Stevensville, Things To Do, Whitefish on February 18, 2019 by glaciermt. In a place with so much room to roam, there’s always space for more awesome. Western Montana’s Glacier Country is continually expanding its offerings, because there can never be too many breweries and food hot spots here, and we can always accommodate more adventure. Here’s what’s new in our neck of the woods. Missoula continues to be a haven for beer enthusiasts, now with two more spots to savor the sip: Gild Brewing—a brew pub on Missoula’s coolest block, the Hip Strip—boasts craft brew, epic Sunday brunch and a basement arcade. 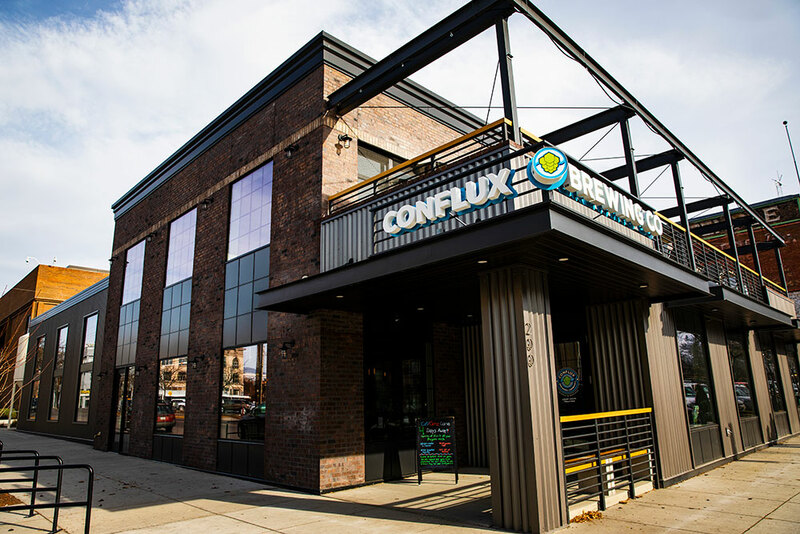 Conflux Brewing offers a convergence of delicious beer, a unique menu with a Southern twist and sustainable brewing practices all in the heart of downtown. Not far from Missoula, KettleHouse Brewing Company has opened its latest tap room adjacent to the the KettleHouse Amphitheater on the banks of the famous Blackfoot River in Bonner. New breweries keep pouring into Western Montana. Kalispell also boasts two new places to wet your whistle with local, finely crafted beer. Bias Brewing taps a few mainstay brews, but really gets creative with seasonals and rotators. Their diverse selection includes Crooked Cookie Stout, Chaotic Good Ginger Beer and Equinox Blood Orange Gose, and their corner kitchen features food from a popular local restaurant, Food for the Soul 2. Kalispell’s Sacred Waters Brewing pays homage to Montana’s wild places crafting good beer and hosting events like yoga and live music. A little closer to Glacier National Park, pull up a barstool at the Gunsight Saloon in Columbia Falls. This old-school saloon-style establishment channeling the Old West features two bars, a gorgeous patio, casual food, 20 beers on tap, a small wine and cocktail selection, and live music throughout the week. Wake up to a smoked brisket omelet or banana caramel French toast at Little Montana in the scenic Mission Valley community of Ronan. For lunch, the quintessential western mountain town of Whitefish is dishing up flavor at The Wich Haus, keeping it simple and savory with sandwiches a la braised short ribs and roasted vegetables. Innovative Asian-fusion cuisine is on the menu at the new Missoula location of Saketome Sushi, and menu items are well paired with wine or sake from their extensive collection. Also in Missoula, Michi Ramen is serving up Asian-inspired dishes like ramen and authentic Japanese noodles. 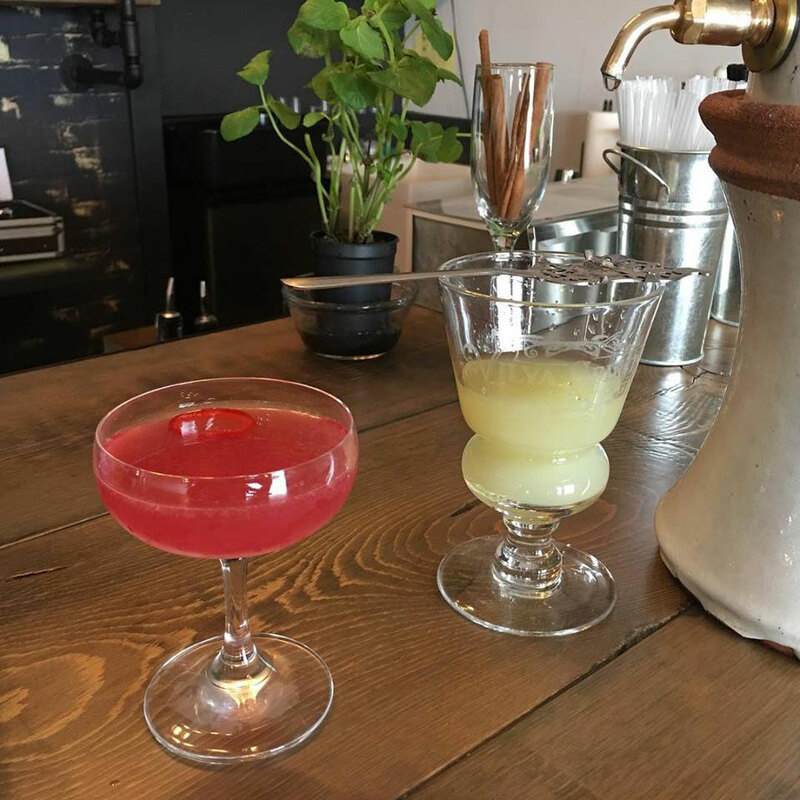 Coram’s Glacier Distilling Co. is now home to Josephine’s Bar & Kitchen, featuring a dinner menu and specially curated cocktail list using house liquors and options from other local distilleries. Think fried green tomatoes, bison gyro, smoked trout cake po’boy, and buttermilk fried chicken in a fireweed cherry bourbon barbecue sauce. Open seasonally. 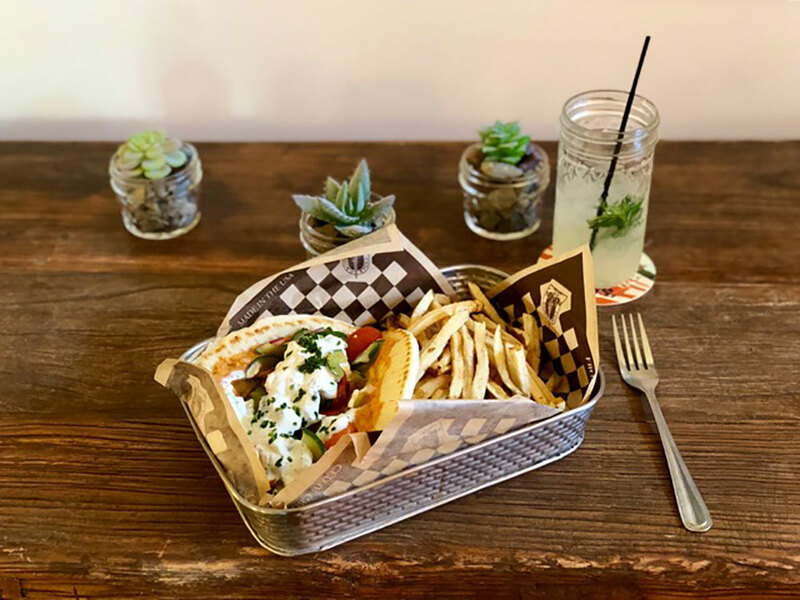 Rebel Roots Kitchen is keeping things healthy in Whitefish with vegan, gluten-free and dairy-free options for the health-conscious consumer. Fuel up on nutritious food that tastes delicious, too. Get your farm-to-table gourmet food fix at Lakeside’s Beargrass Bistro featuring menu items like schnitzel, stroganoff and local steaks. The culinary creations at this Flathead Lake gem are not only mouth-wateringly delicious, they’re crafted with ingredients from the region’s community of farmers, ranchers, gardeners and growers. 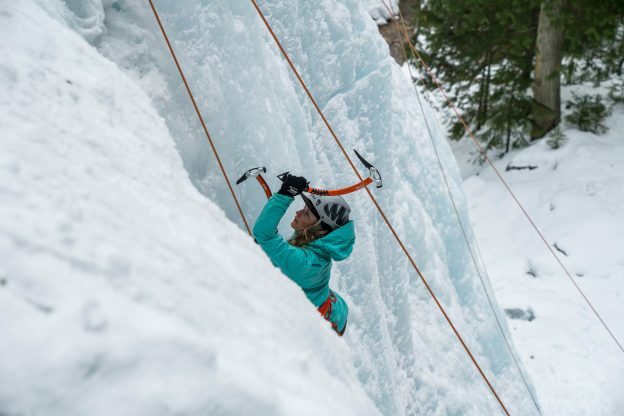 For some authentic Montana recreation and a winter adrenaline rush, Whitefish Vertical Adventures is now offering custom ice climbing excursions and gear rentals. For camping and lodging adventures, West Glacier RV Park & Cabins is set to open in 2019. Quietly tucked behind West Glacier Village, these fully-equipped RV sites feature 50-amp power, full hookups, fire pits and green space. The cabins sleep up to four and feature a full kitchen, a private bedroom and a standard bathroom. The Resort at Paws Up in Greenough has expanded their luxury camping or “glamping” with the addition of another campsite bringing the total number of luxury camping tents to 30. Additionally, they will be adding a resort within the resort called The Green O, with 12 new one-bedroom homes for couples to reconnect with nature and disconnect from everyday life with unobstructed views of the forest canopy and custom-tailored service. The much-anticipated Missoula Mercantile project opens in 2019, too. The first floor of the Mercantile Hotel will feature bars, restaurants and retail space, and a new art program, where hundreds of pieces of local art will be on display. This entry was posted in Columbia Falls, Coram, Food, Greenough, Kalispell, Lakeside, Missoula, Montana, Montana Fun, Ronan, Things To Do, West Glacier, Whitefish on January 7, 2019 by glaciermt. Imagine you’re waterskiing, but you’re being pulled by a horse and rider through the snow. That’s how many participants describe skijoring, an outrageously entertaining winter activity that’s rapidly gaining in popularity in Western Montana’s Glacier Country. Each team consists of a horse and rider pulling a skier by a 30- to 50-foot-long rope. The skier sails over jumps, speeds through slalom gates and captures rings. Skiers may hit speeds of up to 60 mph during acceleration. Each team takes two runs through the course, which may be straight, U-, J- or L-shaped, and ranges from 600 to 1,000 feet long. The skier must cross the finish line in an upright position, on at least one ski and holding the rope. Both run times are combined to get the team’s final score, minus time penalties for missing jumps, gates and rings. Races take place throughout Glacier Country from December through February, so put on your long underwear, stuff some hand warmers in your pockets and go watch—or even try your own hand at—one of winter’s wildest competitions alongside die-hard skijoring fans. 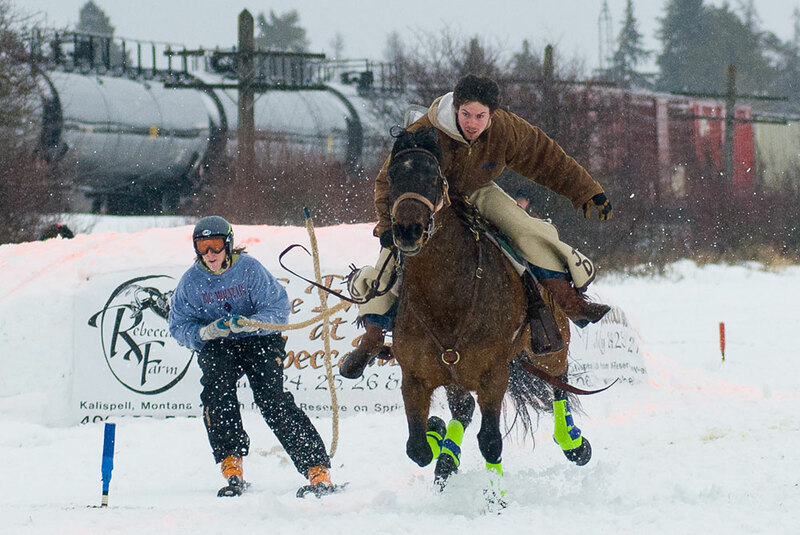 Rebecca Farm in Kalispell, best known for its annual July equestrian extravaganza of dressage, cross country and showjumping, is a natural fit to host a major skijoring event. Eighty teams and thousands of spectators made their inaugural race in 2017 a roaring success. Held the last weekend in December, skijoring at Rebecca Farm kicks off the Skijoring America racing season. It’s also a great way to spend the last weekend of the year. Downtown Kalispell is a short 5.5 miles away from the event, making lodging, dining and shopping a breeze. 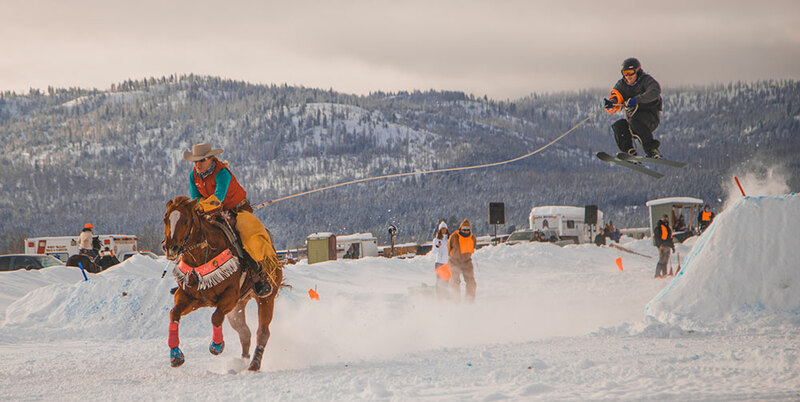 Whitefish Winter Carnival’s two-day skijoring competition in late January ranks as the oldest and most storied of Montana’s skijoring competitions. In the 1960s, skijorers raced through downtown Whitefish. Legend has it that one competitor almost went through a store window, and spectators had to watch out for runaway horses. Times have definitely changed. Nowadays, the event takes place at Big Mountain Ranch, a working cattle operation with gorgeous views of Big Mountain. The J-shaped track is great for spectators, and the costume division is particularly entertaining. The ranch is just 3 miles from town, so plan to eat, shop and overnight in Whitefish. You could also tack on an extra day or two to ski fresh powder on the slopes at Whitefish Mountain Resort. The Wilderness Club, a luxury ranch in Eureka, will hold its first-ever skijoring competition in early January. Close to the Canadian border and Lake Koocanusa, Eureka will be in breathtaking winter wonderland mode. After the races are over, settle in fireside at the Wilderness Club Lodge, or warm up in the hot tub. Mid-February will bring Skijor Columbia Falls’ inaugural “Soldiers, Saddles and Skis: The Race for Valor,” a fundraiser for Valor Equine Therapy. Combine your support for the skijorers and their noble cause with a trip to nearby Glacier National Park for an even more unforgettable weekend of alpine adventures. Not content to sit on the sidelines? Book a stay at The Wilderness Club in Eureka, The Resort at Paws Up in Greenough or Triple Creek Ranch in Darby. Along with top-notch accommodations, they all include skijoring on their lists of guest activities. 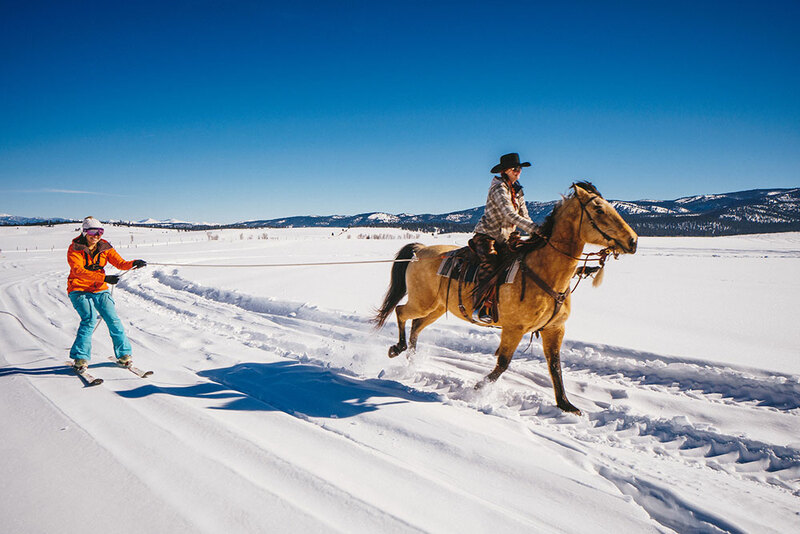 If you’ve already got other lodging planned, both The Wilderness Club and The Resort at Paws Up offer skijoring activities to the public. This entry was posted in Columbia Falls, Darby, Eureka, Events, Flathead Valley, Greenough, Kalispell, Montana, Montana Fun, Outdoor Fun, Whitefish, Winter Fun on December 10, 2018 by glaciermt. Winter in Western Montana’s Glacier Country is pure magic; we really know how to deck the halls and celebrate the season of giving with all things merry and bright. It’s also true that winter’s the time of year when it’s pretty easy to get a little stir crazy, which is why we fill the season with holiday events and celebrations galore. You would be hard-pressed to find a more authentic Western Montana evening than a Christmas stroll. Wander the streets and enjoy the perfect combination of wagon rides, chestnut roasting and vendors selling Montana-made goods and artisan crafts. The holiday celebration doesn’t end there. Experience the splendor of a Parade of Light and prepare to be swept up in the magic of the holidays. Sightings include Santa, reindeer and floats adorned in lights galore. If you are ready to cozy up inside for a unique and unforgettable winter experience you will be pleasantly surprised to find out that the state’s rugged exterior belies a highly developed artistic sensibility. 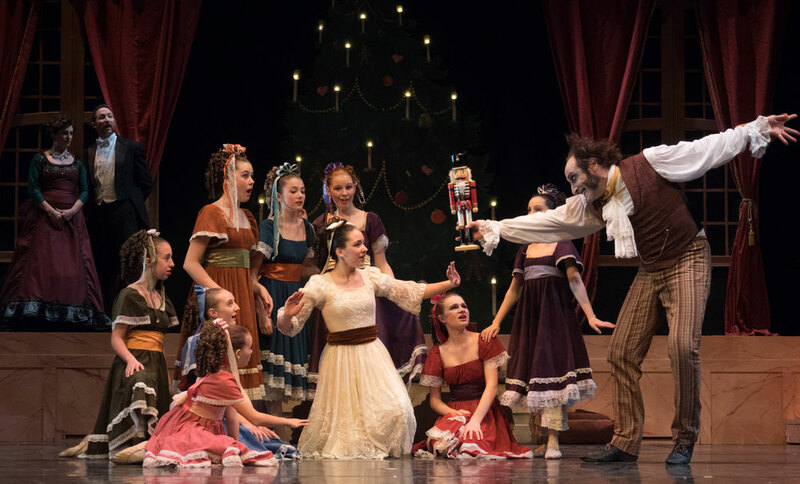 Musicals, symphony concerts, ballets and more dot the region during the holiday season and are a Western Montana specialty. Attend the timeless performance of “The Nutcracker Ballet” (University of Montana’s Adams Center), enjoy a buttered popcorn and a soda or adult beverage while watching classics like “It’s a Wonderful Life” (Roxy Theater), or listen to This Sacred Season and “Messiah” with the Glacier Symphony (Whitefish Performing Arts Center). Here are many ways you can add a splash of culture to the holiday season. 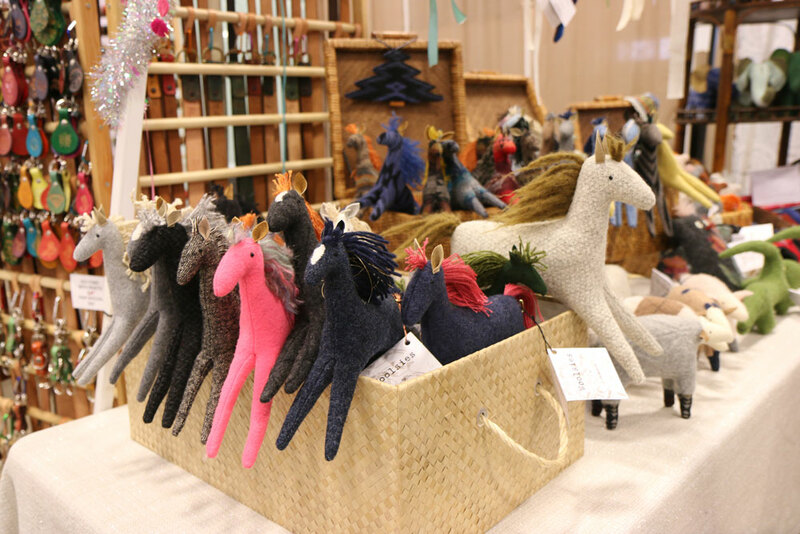 One of the things Western Montana does best is put on a good holiday bazaar. Embrace the spirit of giving this season with gifts from locally sourced and canned foods, hand-crafted jewelry, pottery, woodworking, handmade soaps and other Montana artisan goods and wares. While you’re browsing, be sure to enjoy a cup of cocoa and mingle with the locals—we’re known for being some of the friendliest folks around. 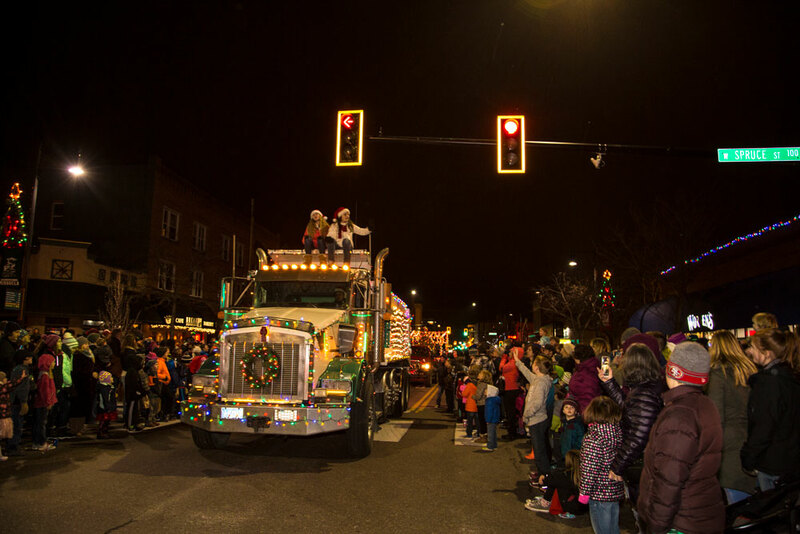 West Shore HOLIDAYFEST at Lakeside Elementary Dec. 1 9 a.m. – 4 p.m.
Glacier Country Montana is always ready to make your trip memorable, but there is a special atmosphere around New Year’s Eve. Whether you are looking for a night out dancing, a fireworks send-off under the vast night sky, or a low-key night downtown without the big-city crowds—we’ve got the best place to close out the holidays and make your 2019 resolutions. Live Music at Fireside Lounge “Fresh Ink” in Whitefish 7 p.m. – 9 p.m.
Bigfork: Located on the bay of Flathead Lake, the storybook town of Bigfork gets a little magical around the holidays. 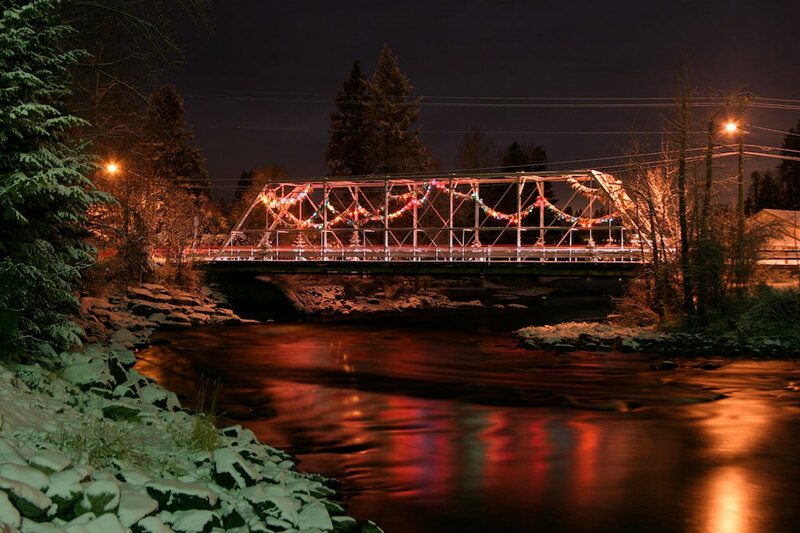 The community “elves” come together every year to adorn the town with wreaths, ribbon, garland and lights, creating authentic Western Montana holiday charm. 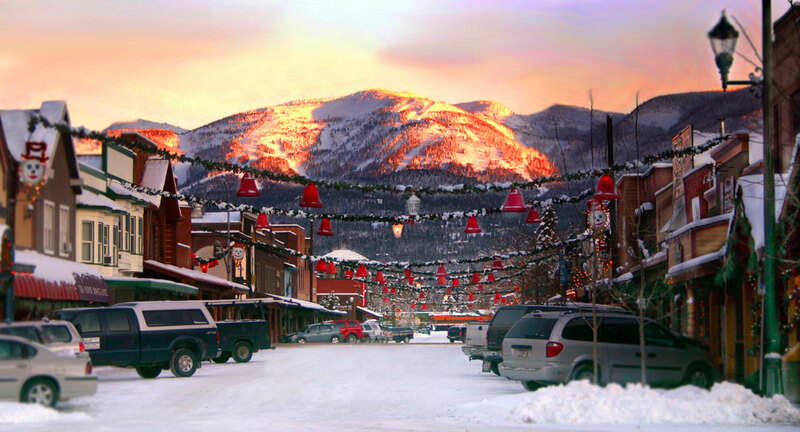 Whitefish: The quintessential mountain resort town of Whitefish goes all out creating an enchanting winter wonderland. A stroll through downtown will yield bells, wreaths, boughs and lights ornamenting each business and weaving through the streets. Ovando: Another stop-worthy town is Ovando. 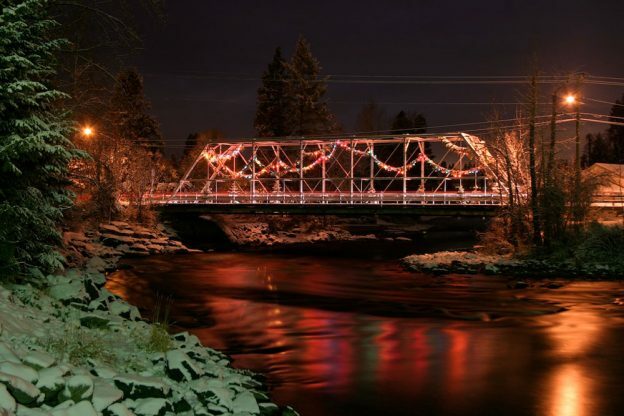 This quaint (and beyond adorable) town lays on the charm for the holiday season. Downtown, the 100-year-old buildings create the atmosphere of an authentic Old West holiday. 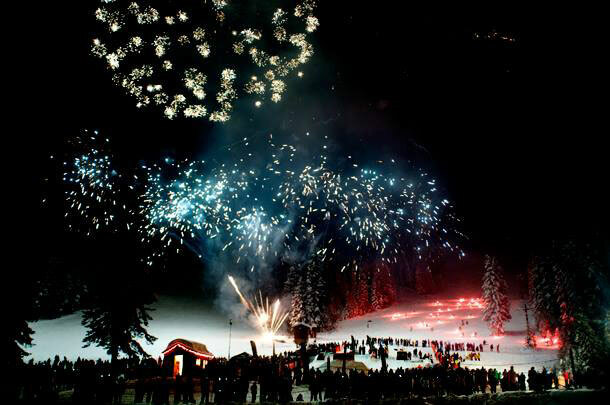 You can also check out a full listing of holiday events at glaciermt.com/events. This entry was posted in Bigfork, Bitterroot Valley, Columbia Falls, Events, Family Fun, Farmers Market, Flathead Valley, Florence, Hamilton, Holidays, Hot Springs, Kalispell, Lakeside, Missoula, Montana, Montana Fun, Ovando, Polson, Ravalli, Ronan, Shopping, Stevensville, Things To Do, Thompson Falls, Whitefish, Winter Fun on November 26, 2018 by GlacierMT.